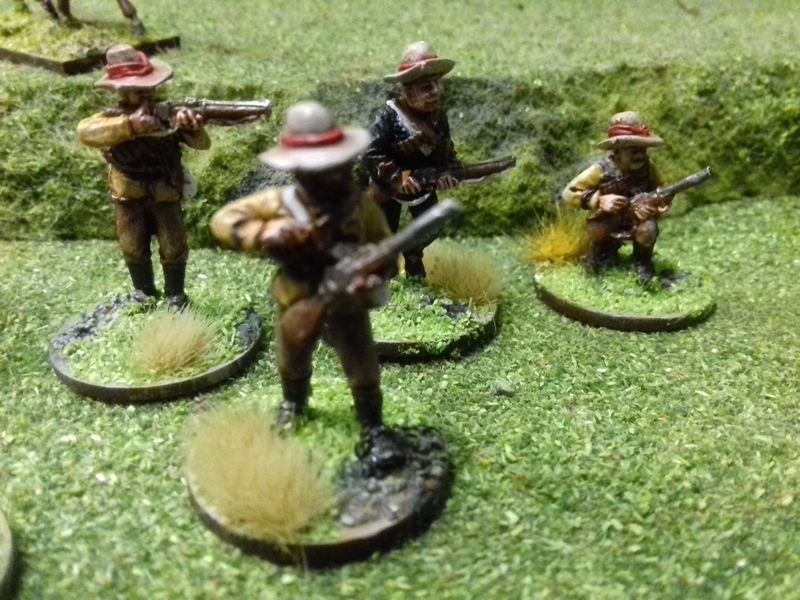 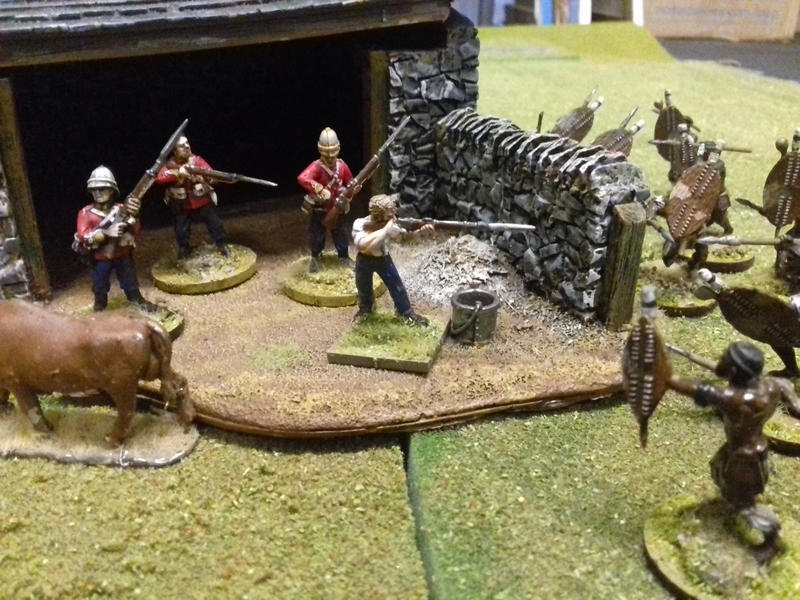 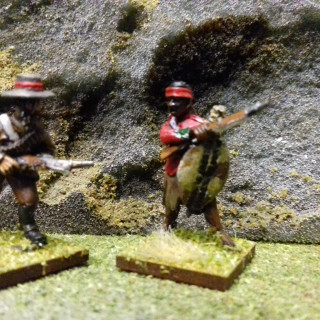 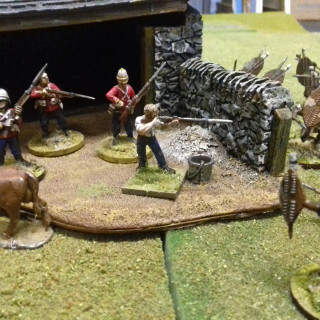 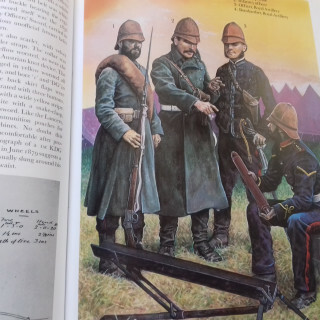 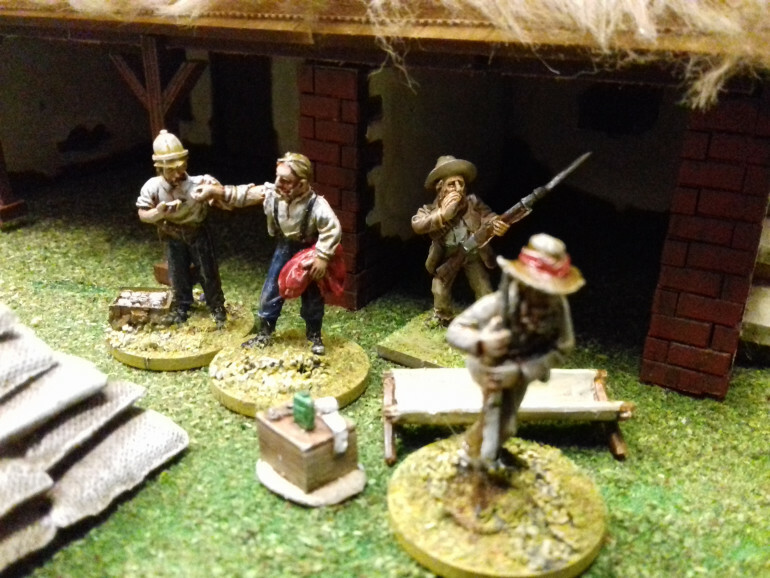 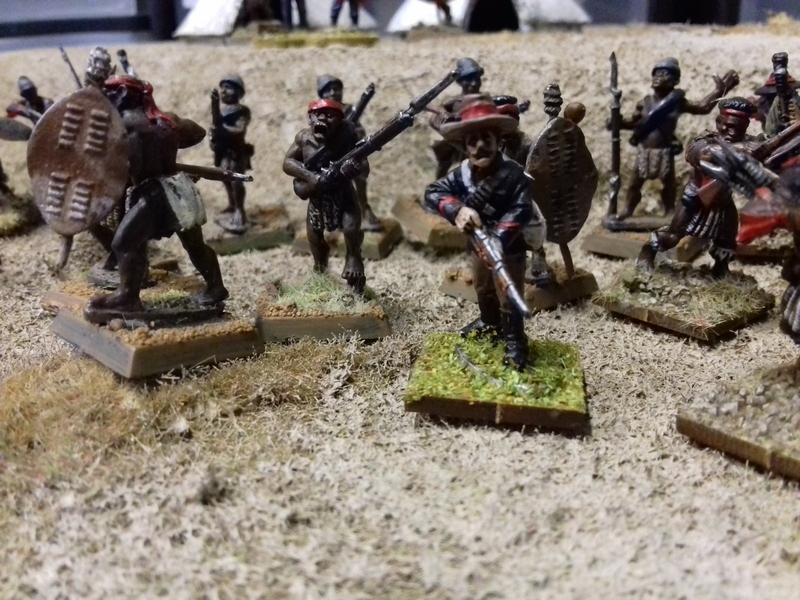 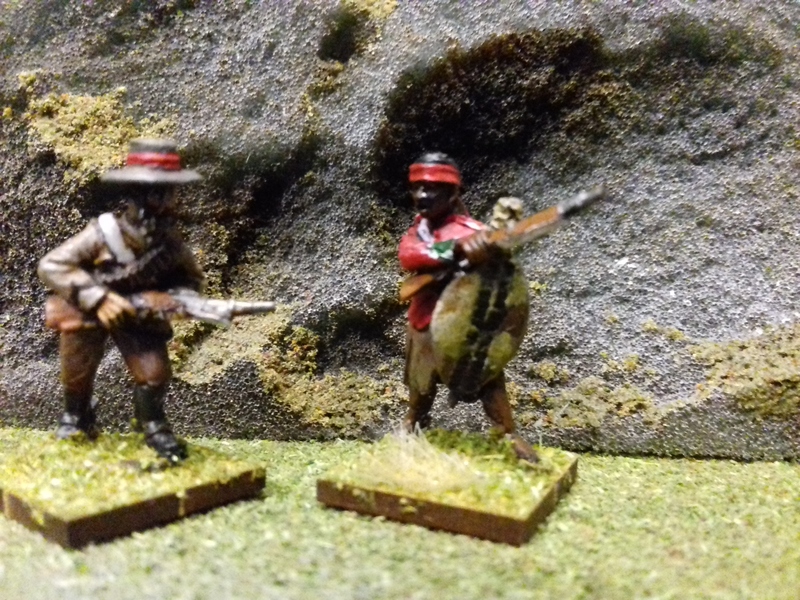 A look at some of the varied units that took part in the Zulu War of 1879. 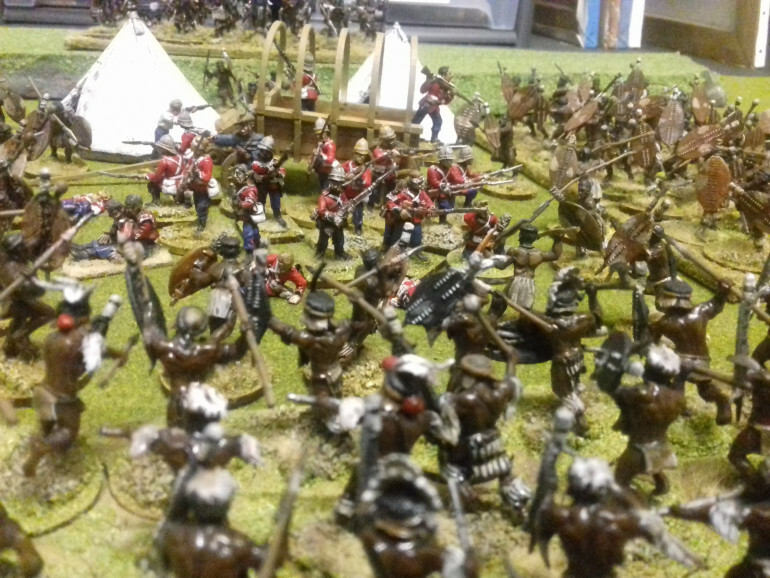 When we think of this war we think or red coats but there were many units involved that are often over looked. 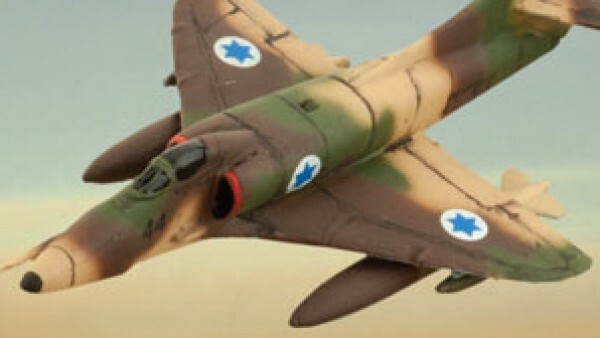 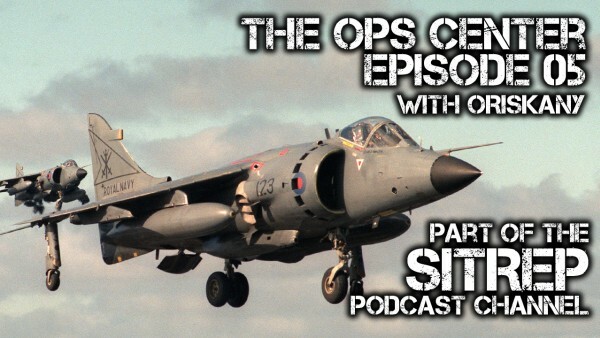 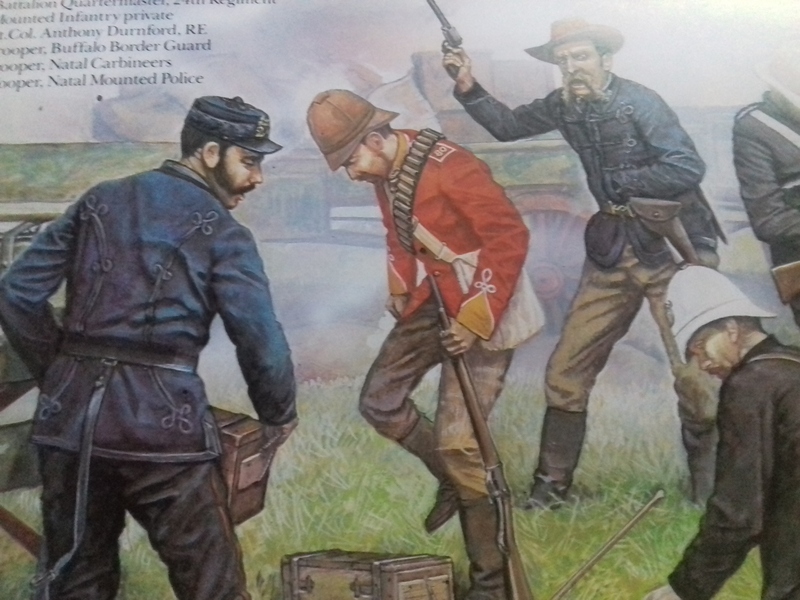 In this this project I will take a look at some of these less familiar forces that took part in the conflict. 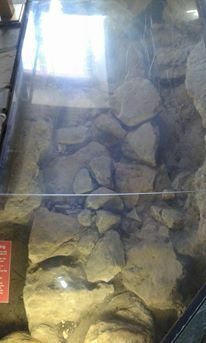 Beneath the floor of the hospital museum at Rorkes Drift is a glass panel allowing you to see the original foundations. 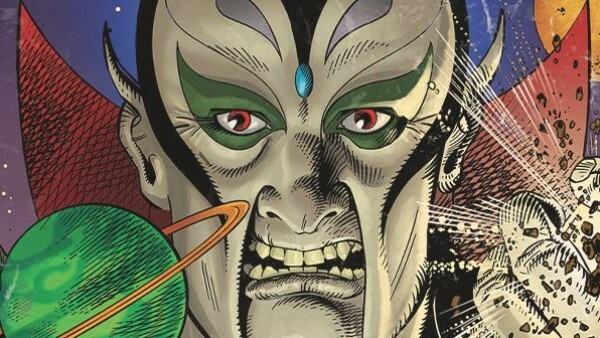 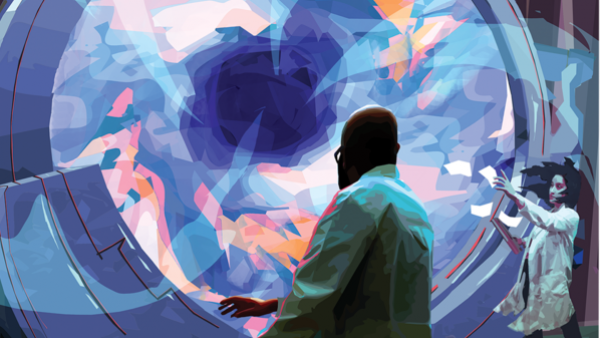 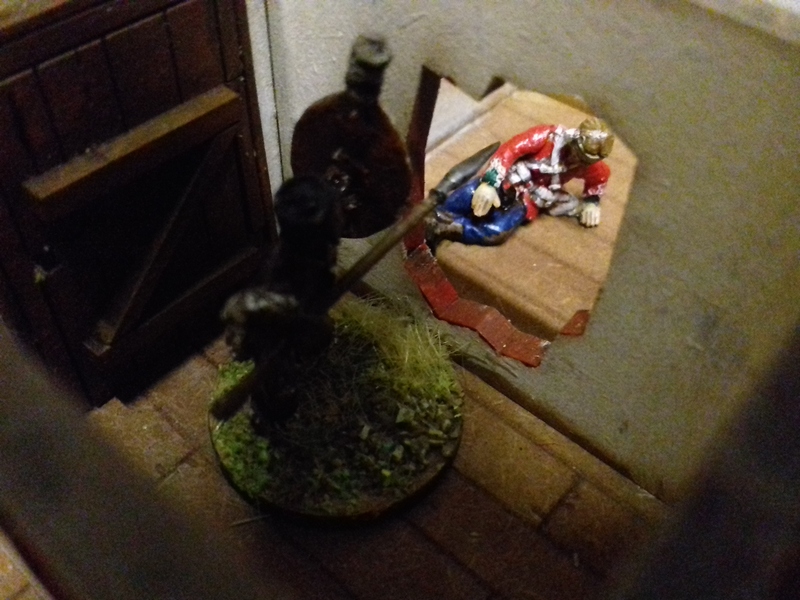 It;s a shame that I didn’t include the text panel when I took the shot. 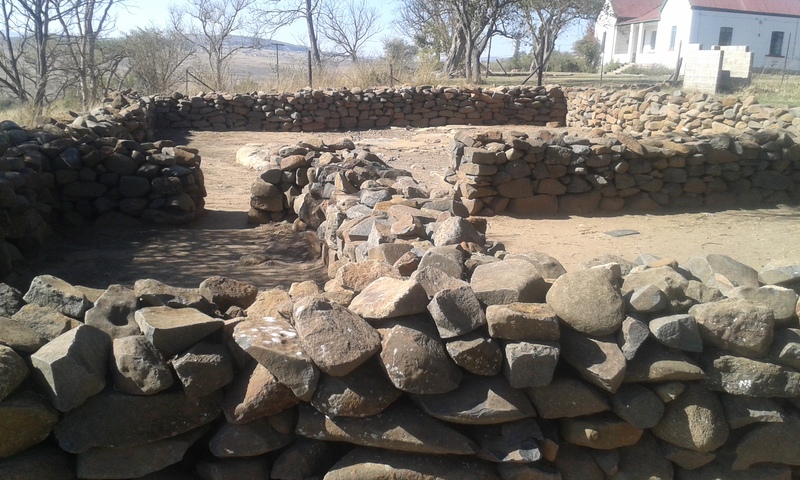 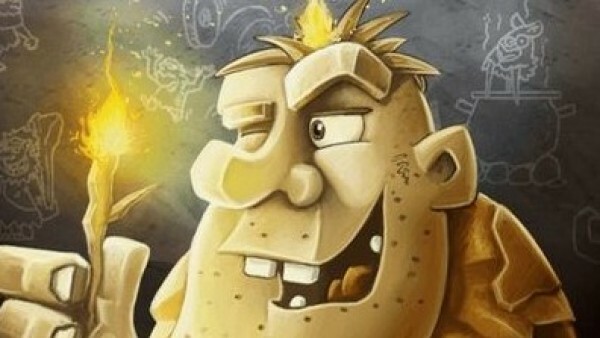 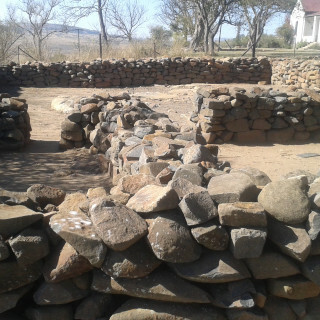 The stone work seems to be the same as the Kraal which makes sense. 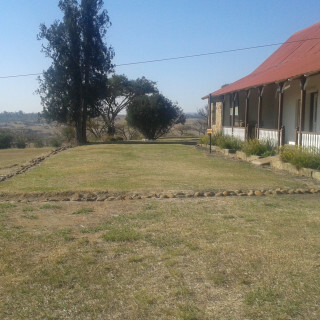 Did the hospital have a just stone floor or did it have wooden boards despite termite issues? 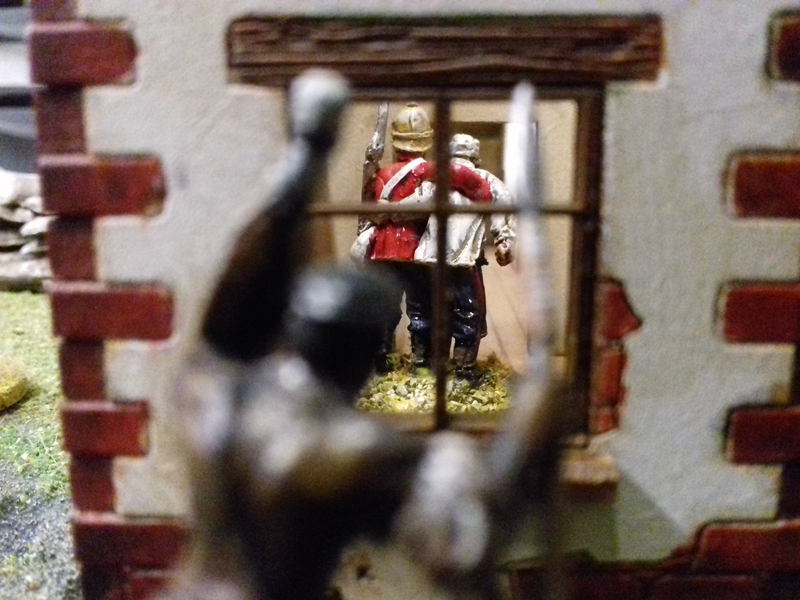 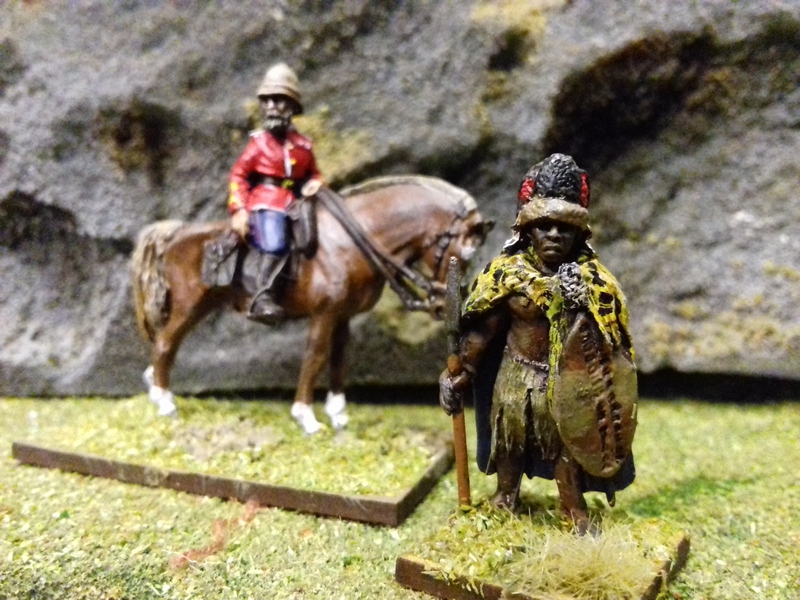 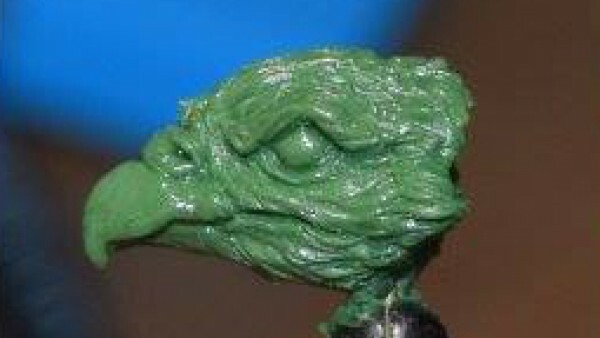 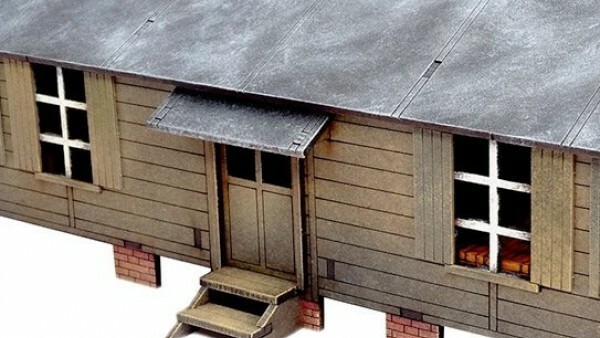 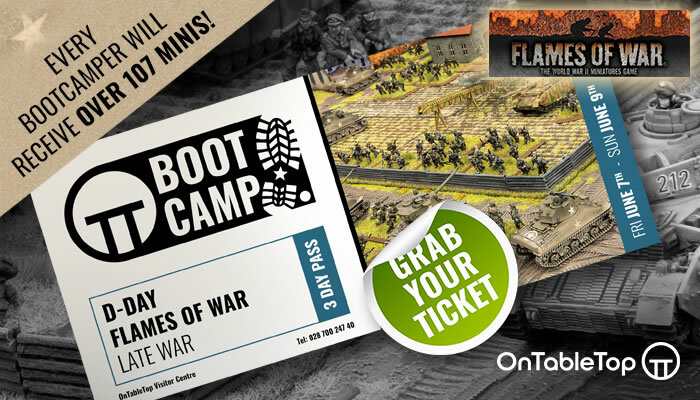 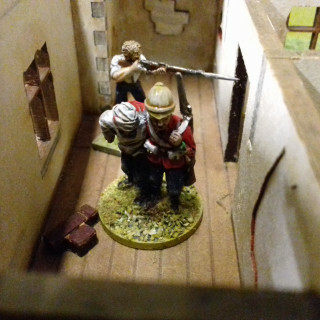 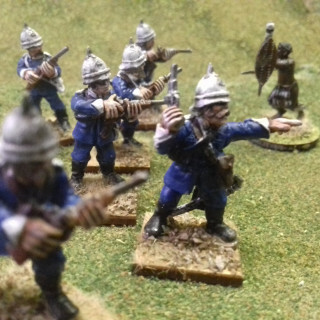 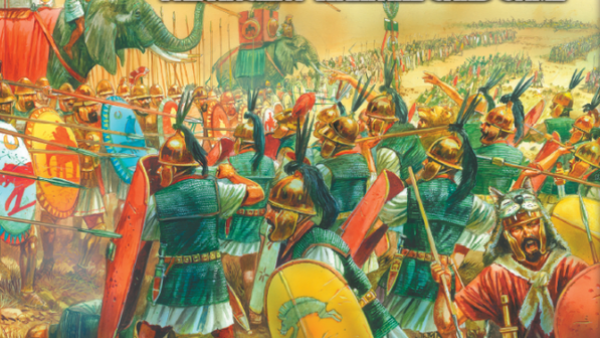 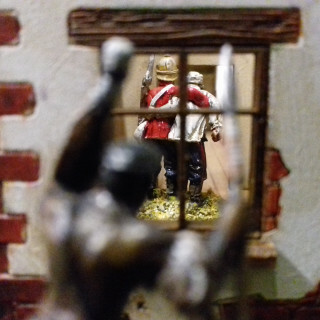 This months Wargames illustrated comes with a sprue of Zulus miniatures. 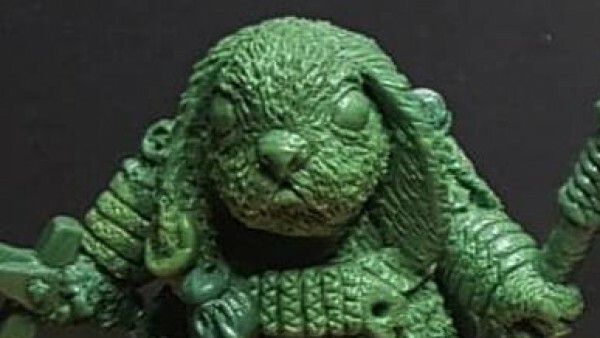 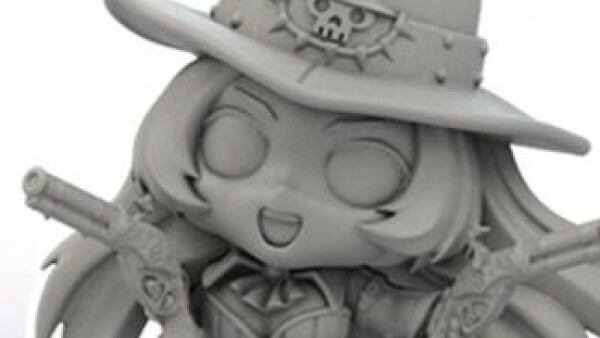 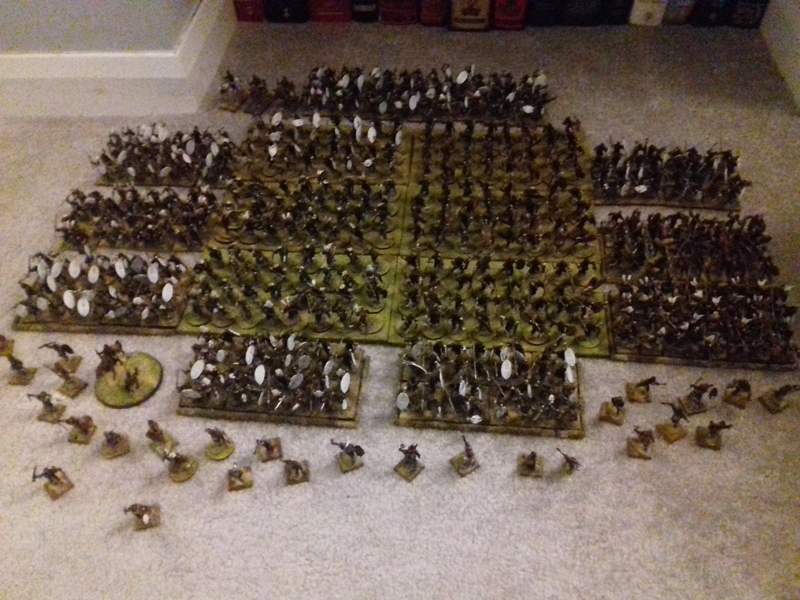 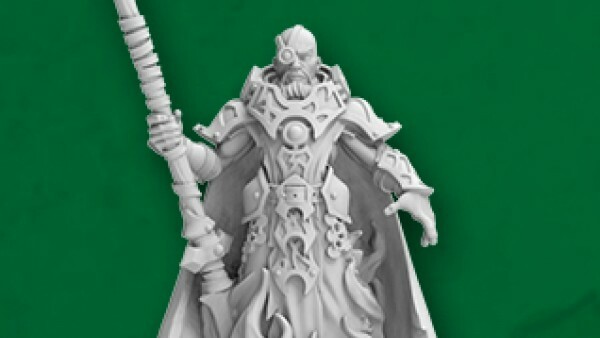 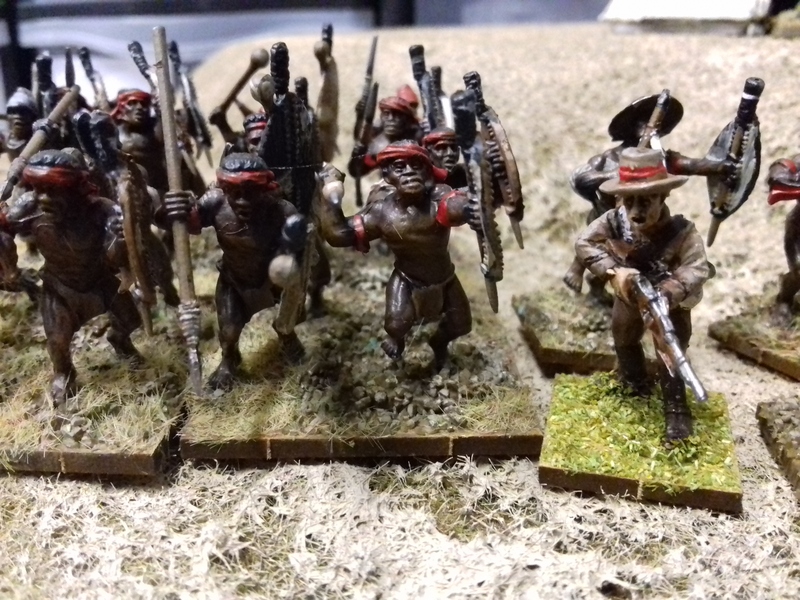 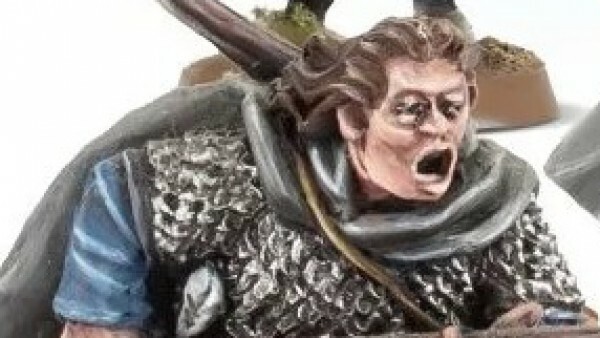 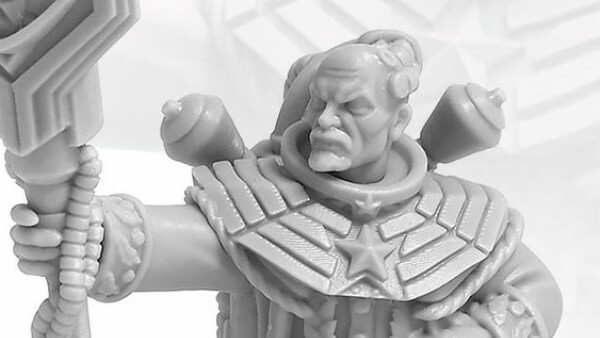 Do I really need four more Zulus? 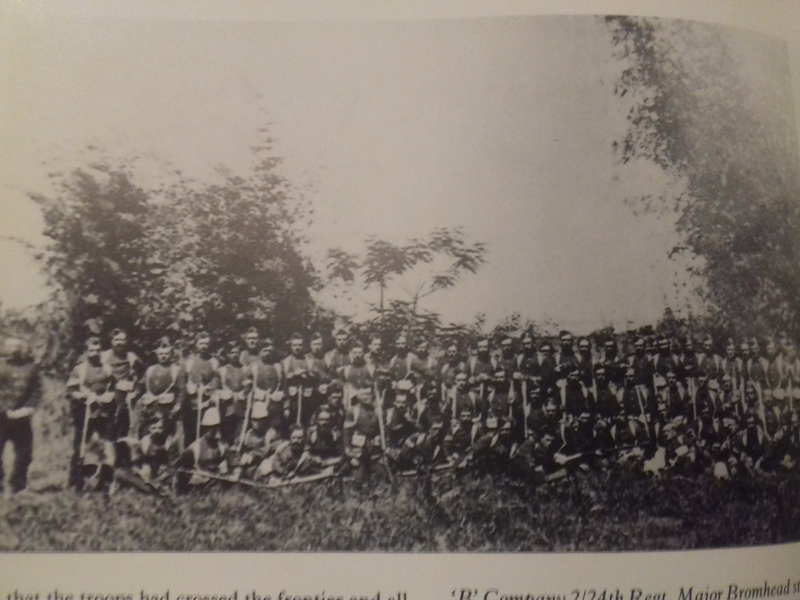 The 99th Lanarkshire Regiment of foot was formed only in 1824. 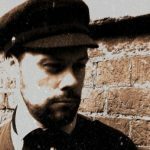 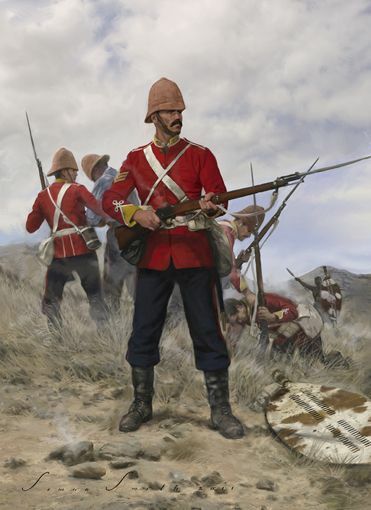 They were first posted to Tasmania as a convict guard before later seeing action in New Zealand, China and the cape in the 1860’s before returning in 1878 in time for the Zulu War. 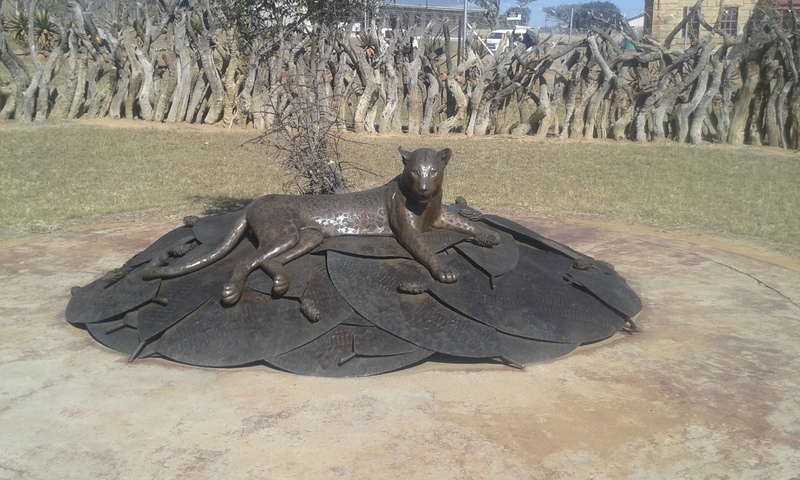 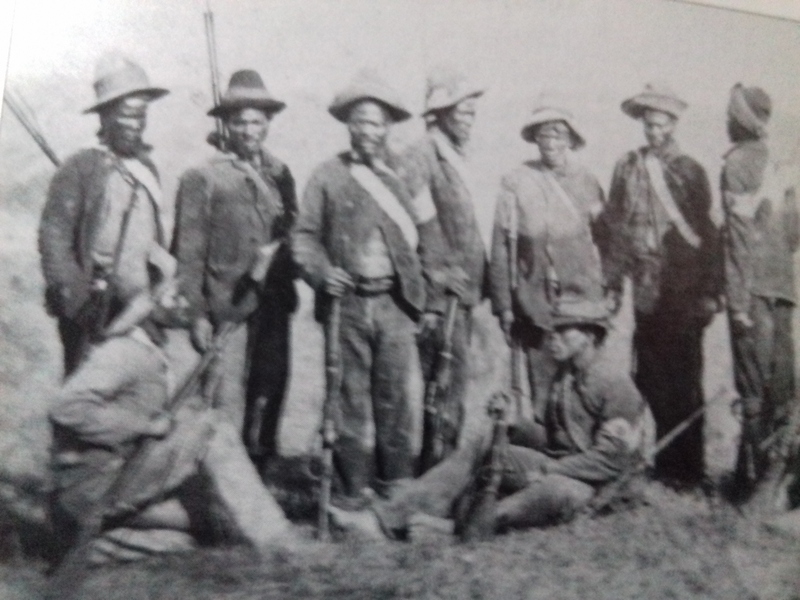 They took part in the battle of Nyezane to releave the besieged station at Eshowe. 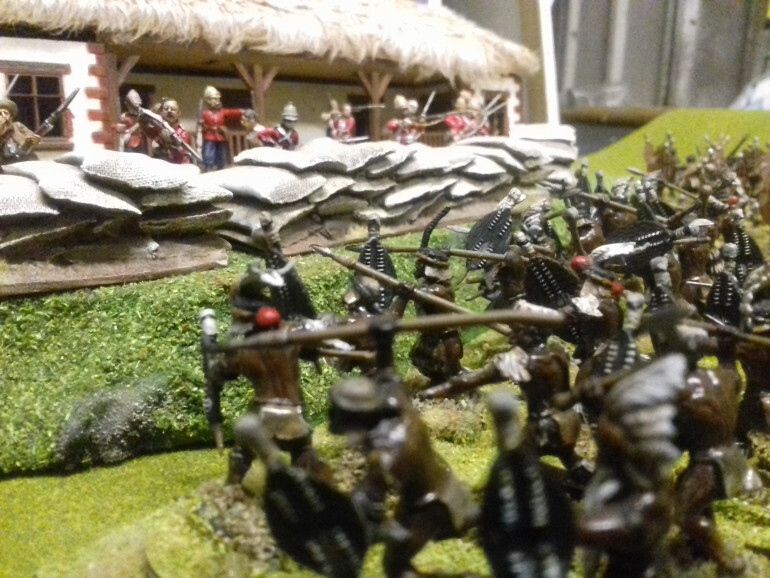 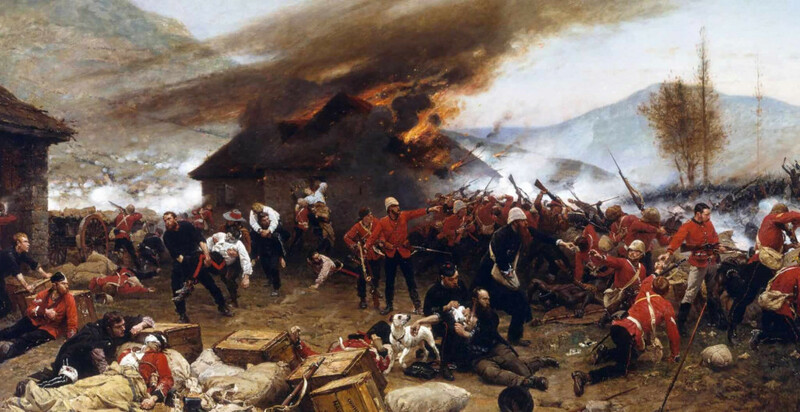 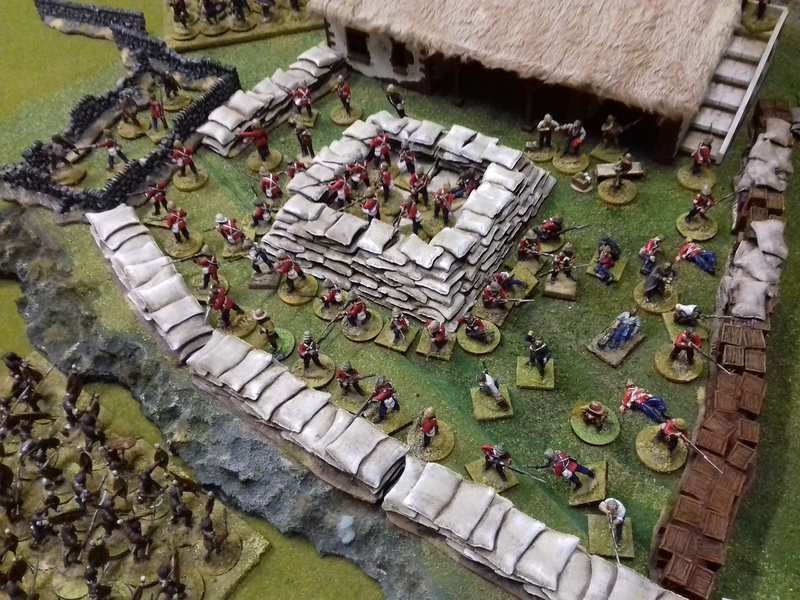 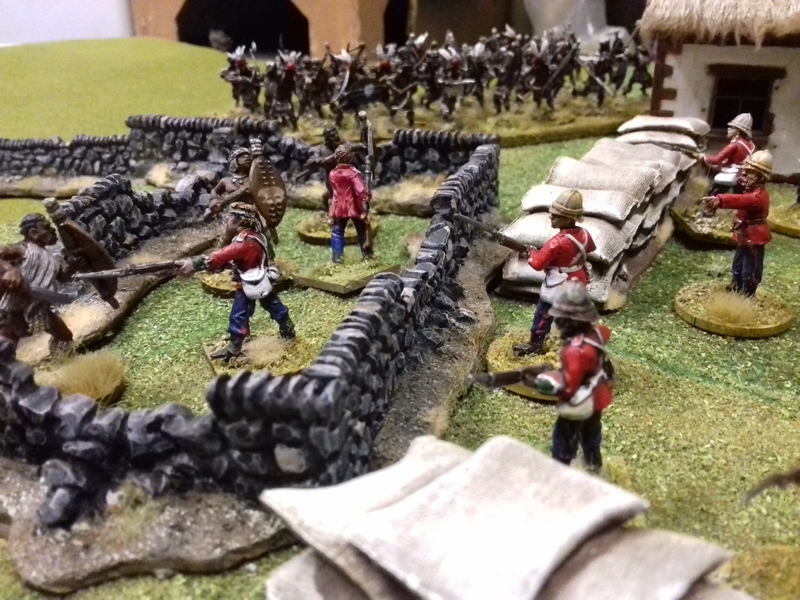 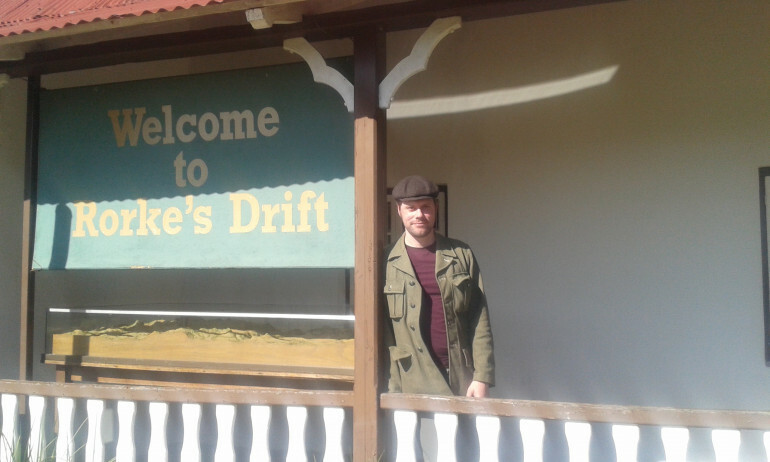 The battle took place around the same time as Rorkes Drift and showed a British force could defeat the Zulus in the open field. 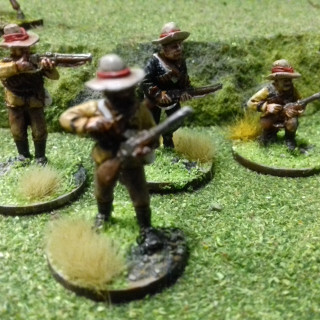 It was nearly a disaster but the 99th later fought at Gingindlovu were they were apart of a larger square formation protected by wagons, a sure defence from Zulu attack. 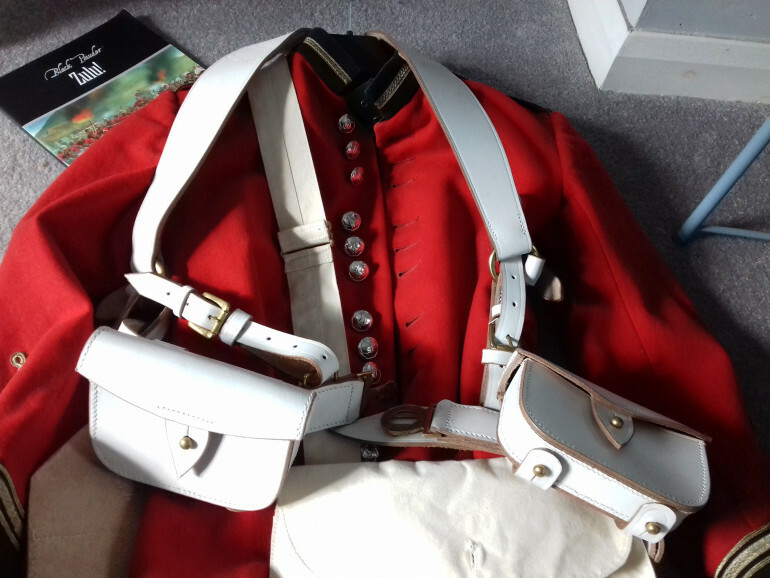 The 99th wore slightly outdated red coats with red facings and buff collars and had black ammunition pouches instead of the usual white. 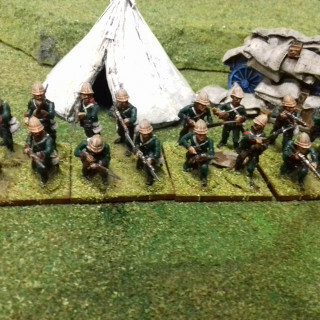 I used Empress miniatures for my 99th in full equipment marching. 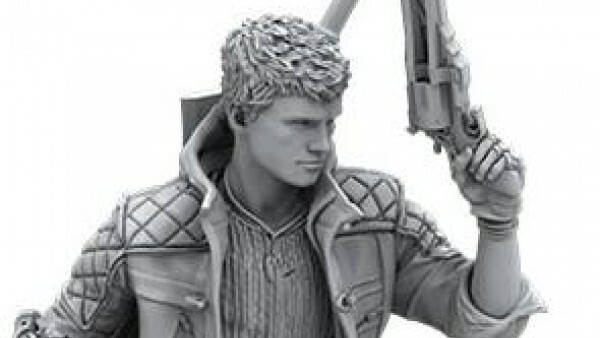 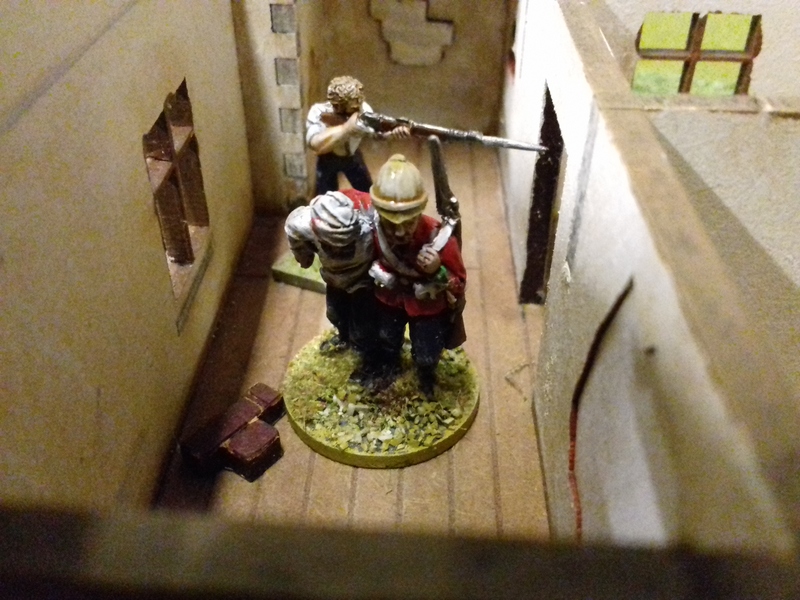 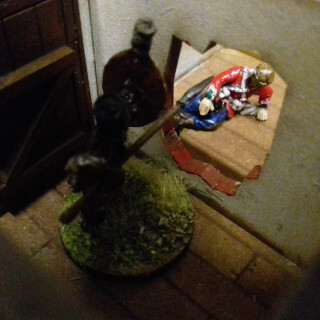 You dont see many miniatures in full rig as it was discarded for combat. The 80th Regiment of foot had been in South Africa since 1877 under the command of Major Tucker. 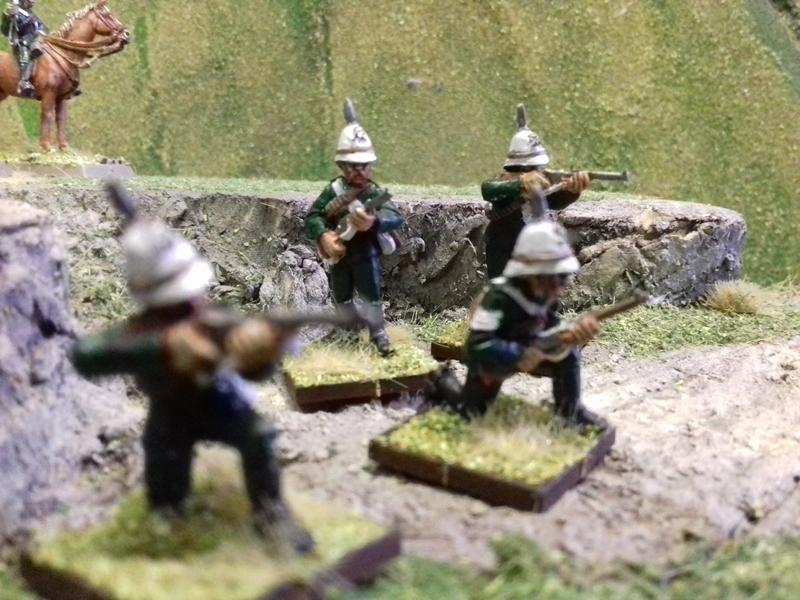 They wore the usual infantry equipment and uniforms but with buff facings rather than the green of the 24th. 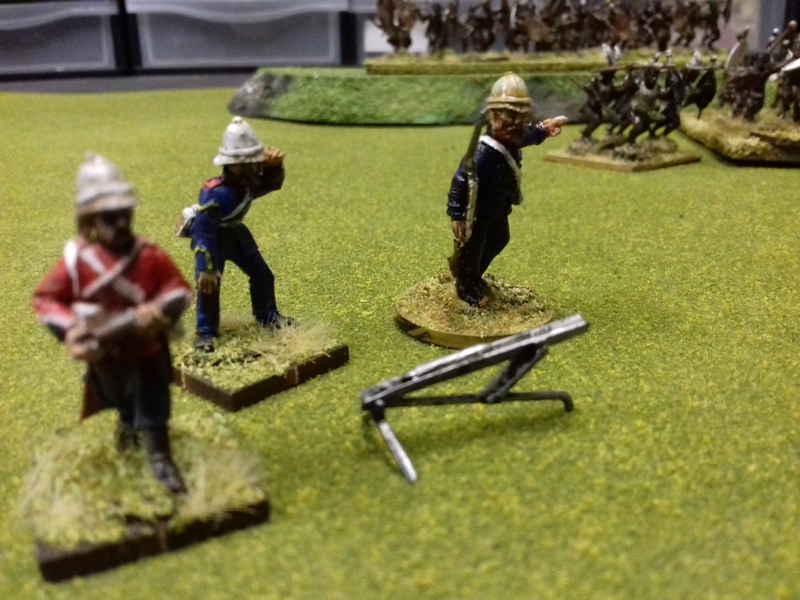 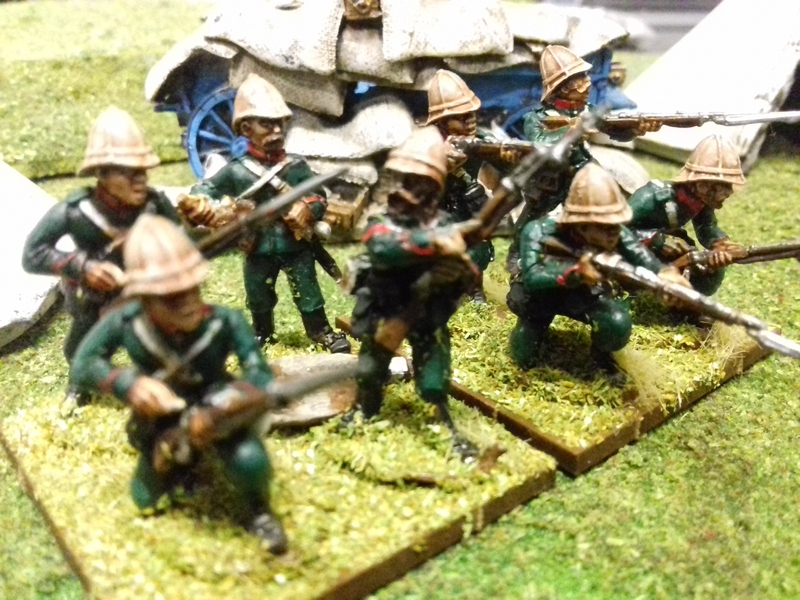 A couple of months after Rorkes Drift a similar number of infantry from the 80th saw action at the battle of Intombe. 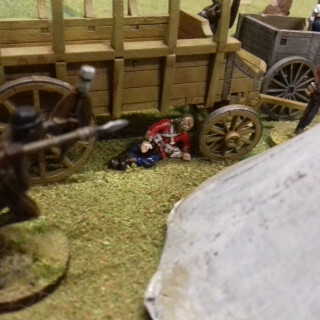 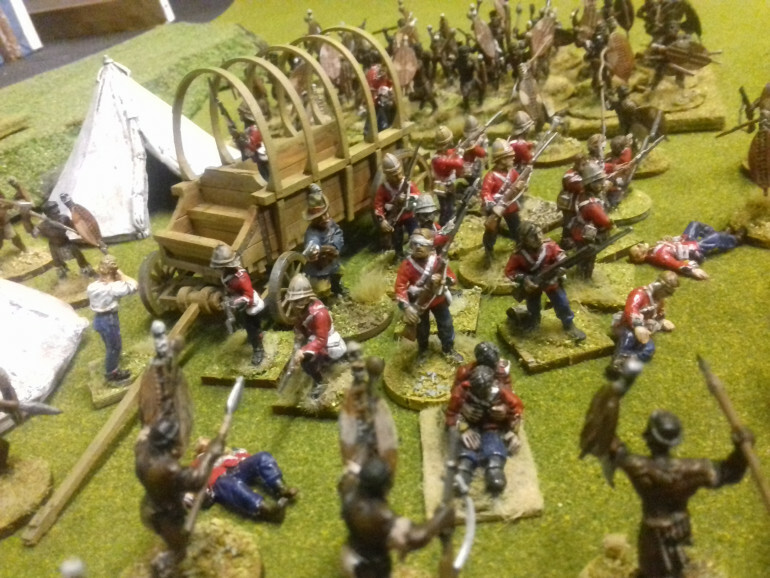 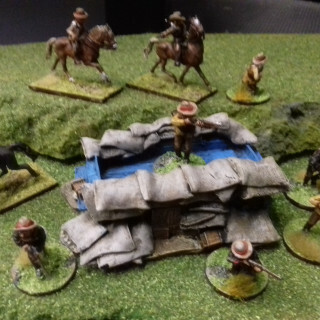 They were transporting supplies across a river and had problems moving the wagons. 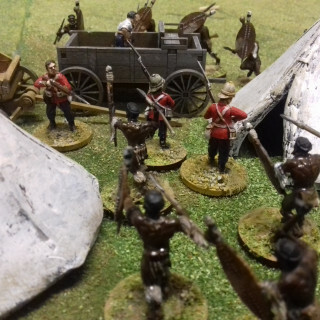 They set up camp on the river bank making a crude laager of wagons which did nothing to stop a surprise Zulu attack that ran through the camp slaughtering the commanding officer present and all the men who were waking up in a daze. 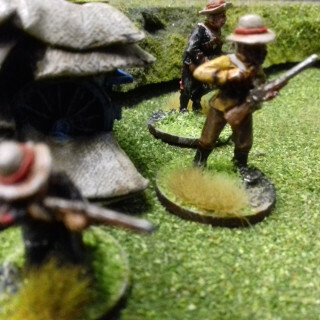 The infantry on the other side of the river gave covering fire while men tried to escape across the river. 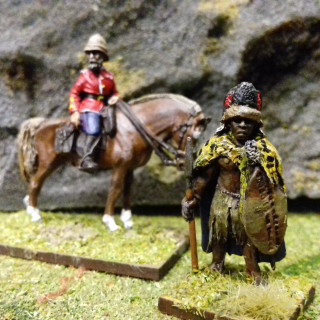 Lieutenant Harward mounted a horse and abandoned his men as Zulus crossed the river in pursuit. 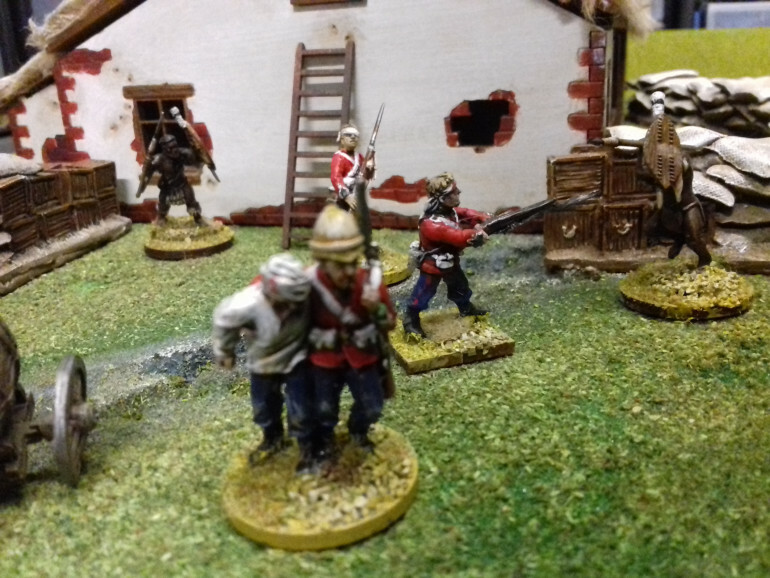 Sergeant Booth who was from Nottingham took command of 40 or so survivors and led them in a retreat for three miles to the safety of a farm house. 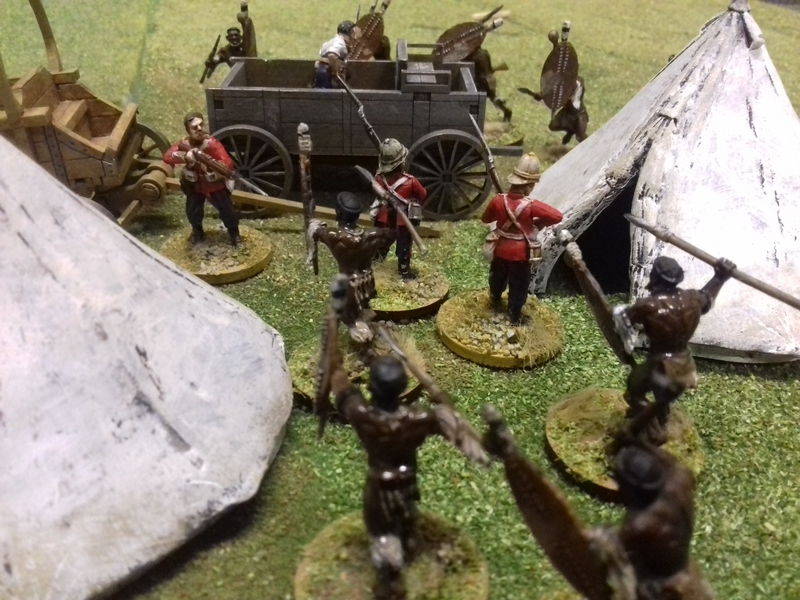 Every time the Zulus drew close Booth would control the mens fire to see them off. 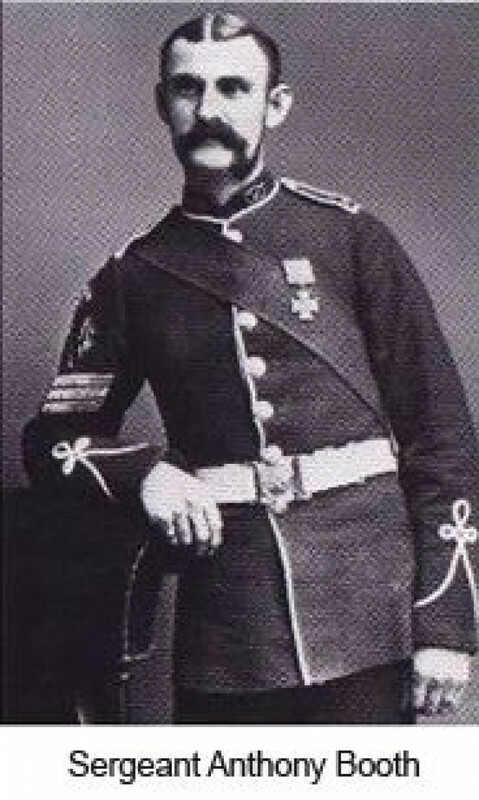 He would later receive the VC for saving his men while Harward resigned his commission after a court marshal. 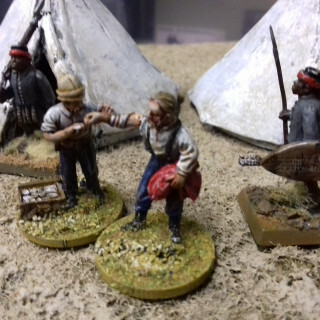 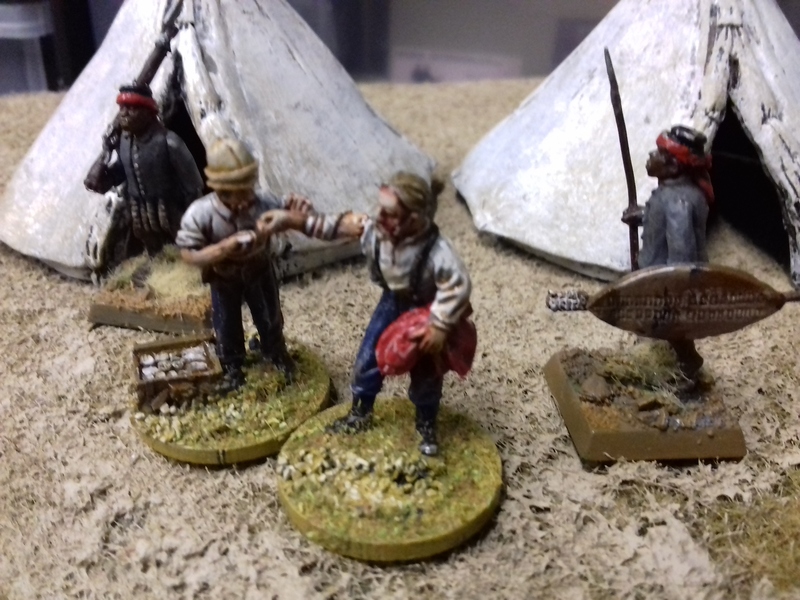 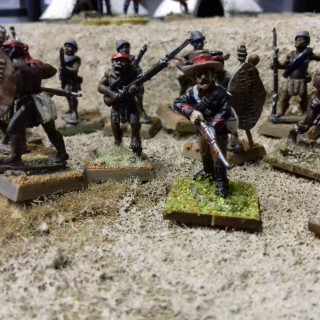 The Zulus ransacked all the supplies back at the camp before they could be stopped. 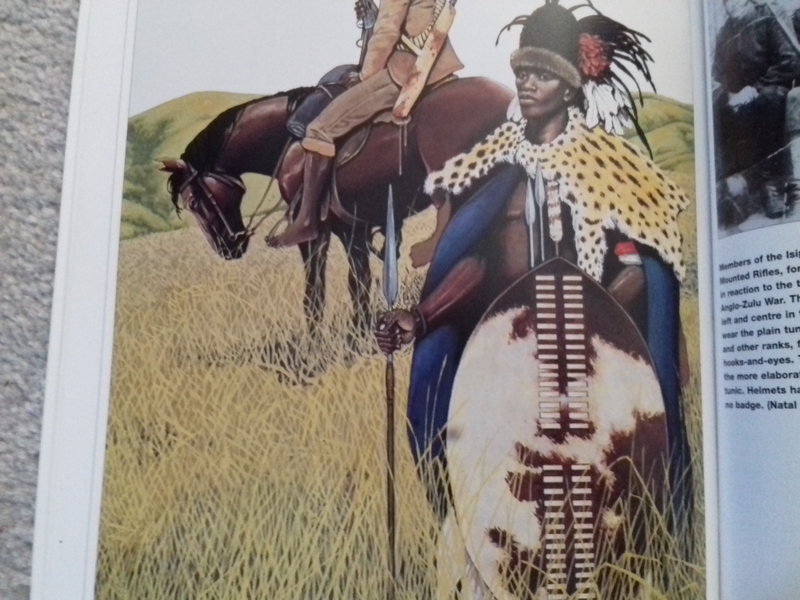 Its interesting that 500-800 Zulus defeated over 100 British troops such a different result to Rorkes Drift. 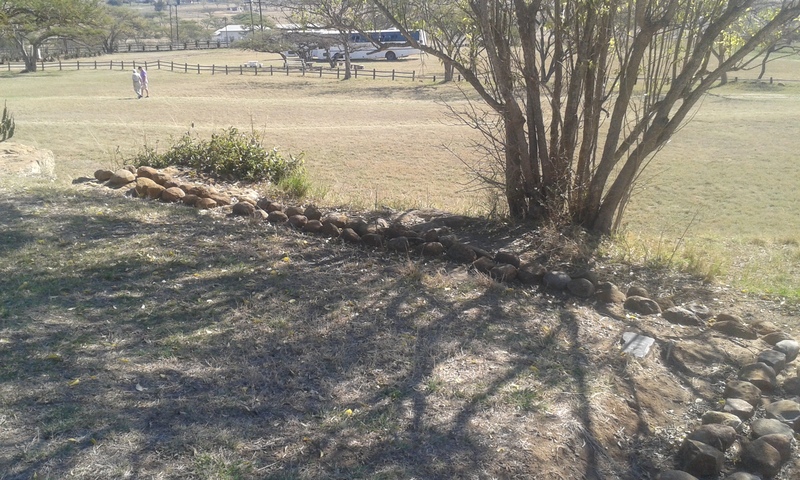 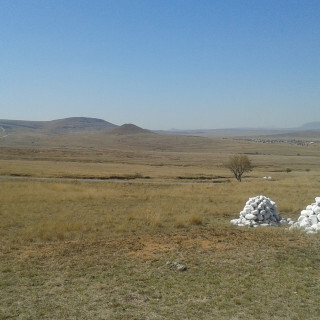 The 80th later thought at Ulundi the closing battle of the war. 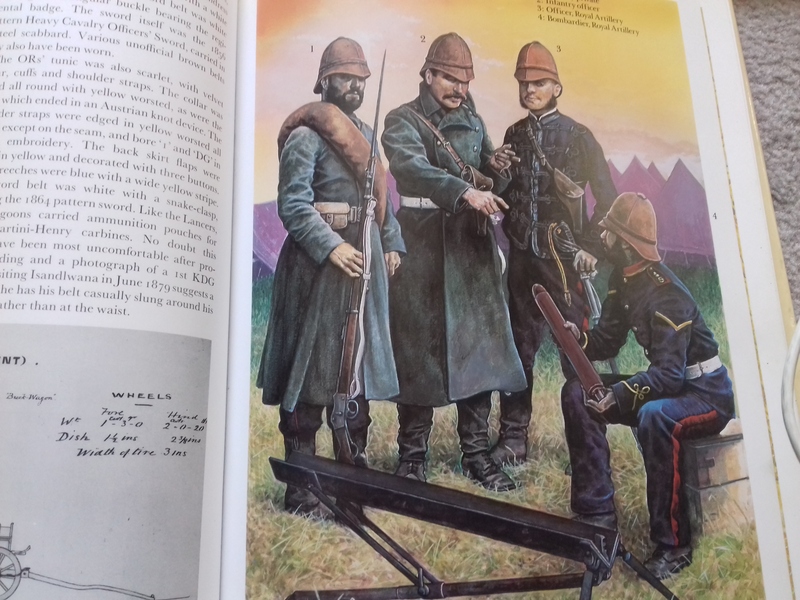 The Napoleonic stick rocket was replaced in 1867 by the Hale rocket. 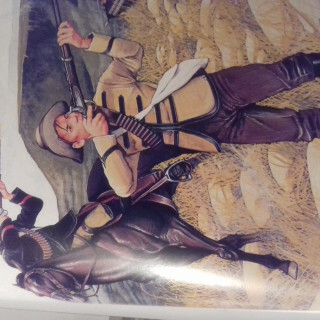 William Hale had sold his rockets to the United States who used them during the civil war before the British army took it on. 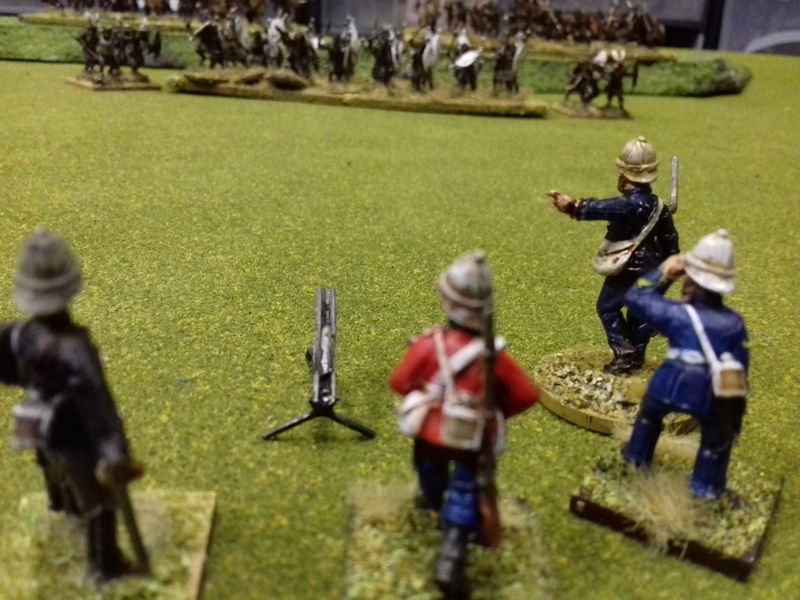 The 9-pdr rocket spun in the air thanks to three vents at the rear of the rocket. 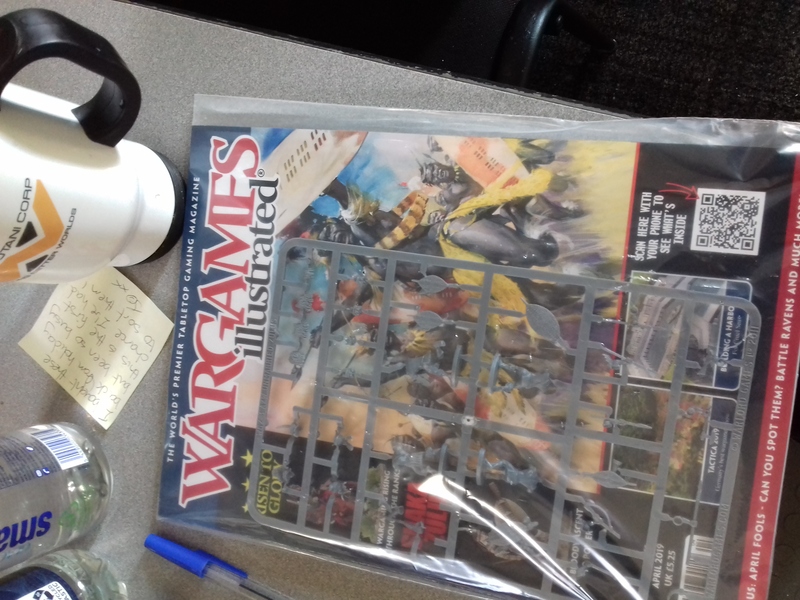 It was launched from a metal trough but could still be very inaccurate. 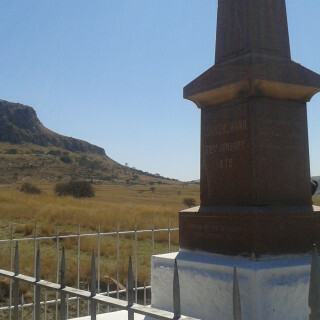 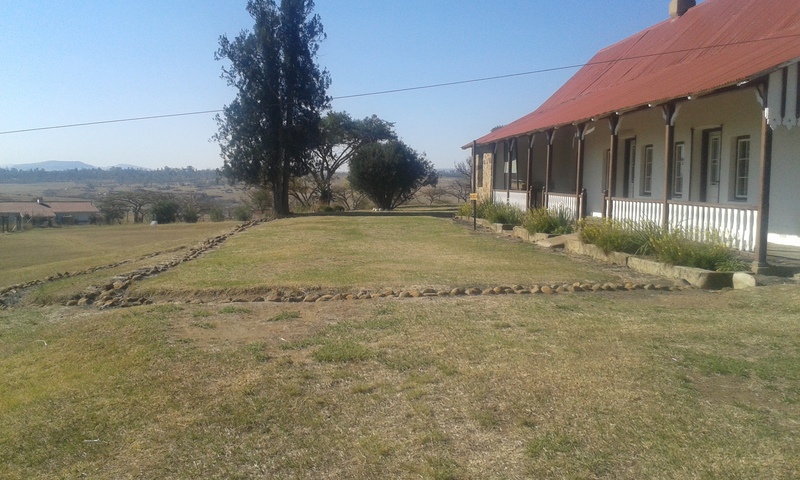 At Isandlwana Major Russel attached to Durnfords no.2 column operated three rocket troughs maned by eight infantryman from the 24th regiment. 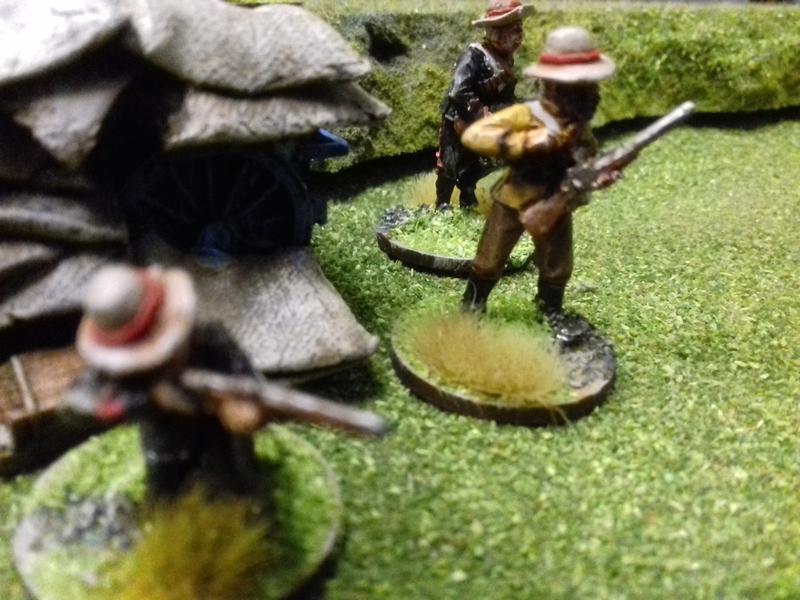 They were caught out in the open and managed to fire a single rocket before being over run and wiped out by the fast moving Zulus. Colonel Wood commander of number 4 column. 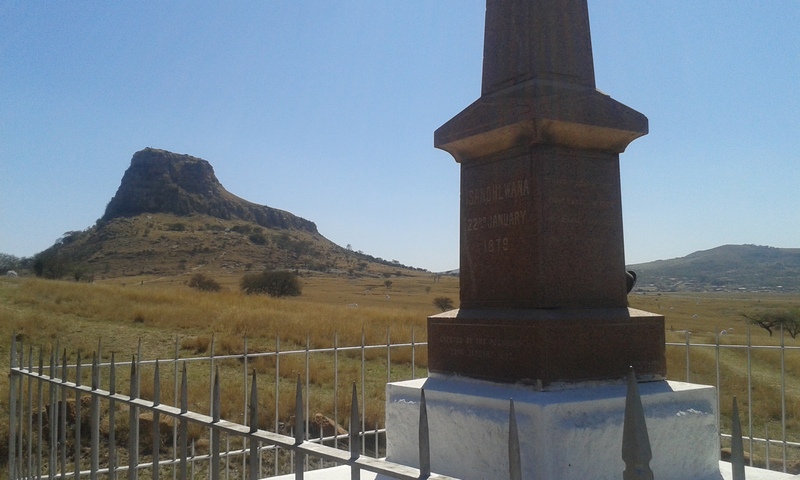 Colonel Everlyn Wood commanded no.4 column and raised over 1000 men from the south eastern Transvaal. 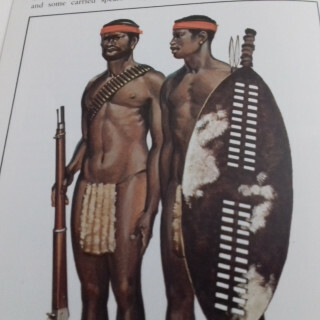 Most were Swazi tribesmen but their ranks later swelled by Zulu defectors. These men took part in the battles of Hlobane some at Khambula and Ulundi. 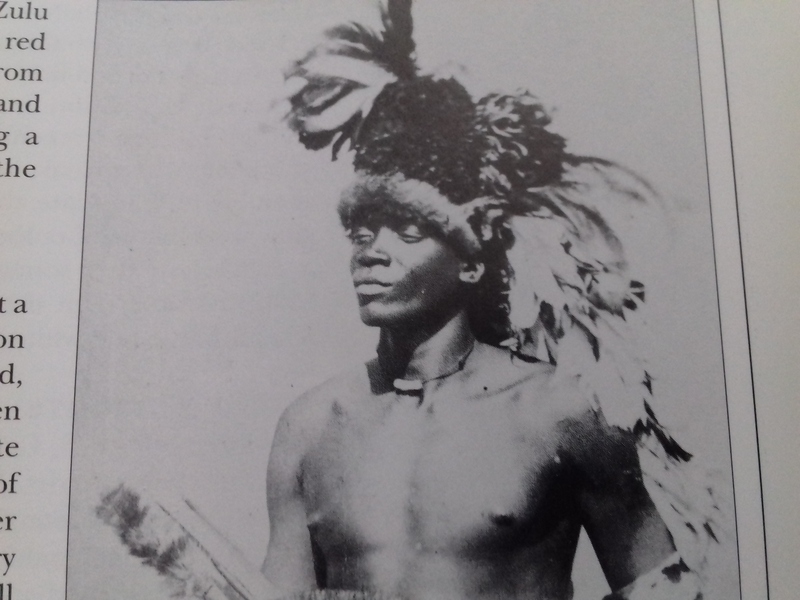 Many irregulars wore full Swazi regalia including very impressive ostrich feathers. 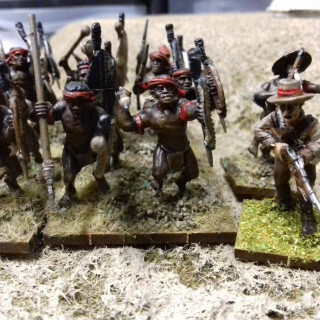 Some converted Zulu warriors could do on the table top. 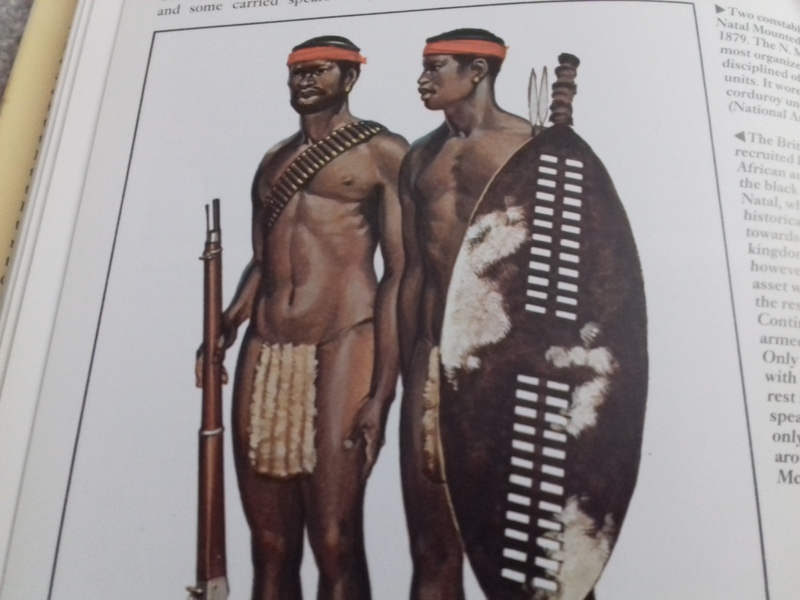 Firearms were restricted to one in every hundred and wore a strip of cloth like the NNC to identify them. 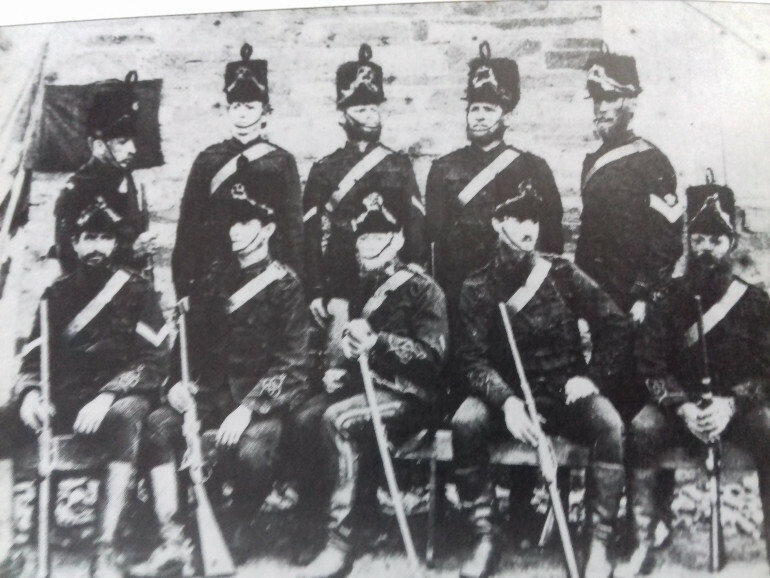 50 Irregulars were recruited as scouts and dressed in old Dragoon tunics. 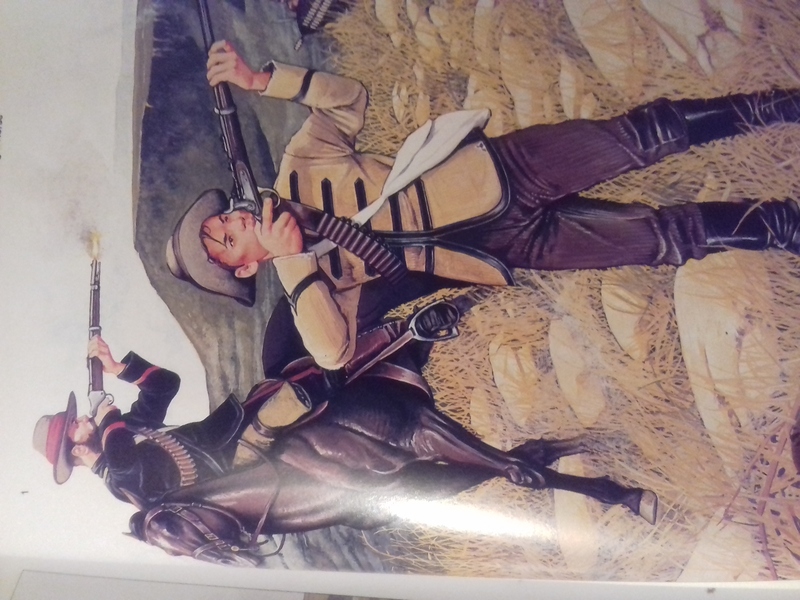 Apparently they were the only uniforms that would fit. 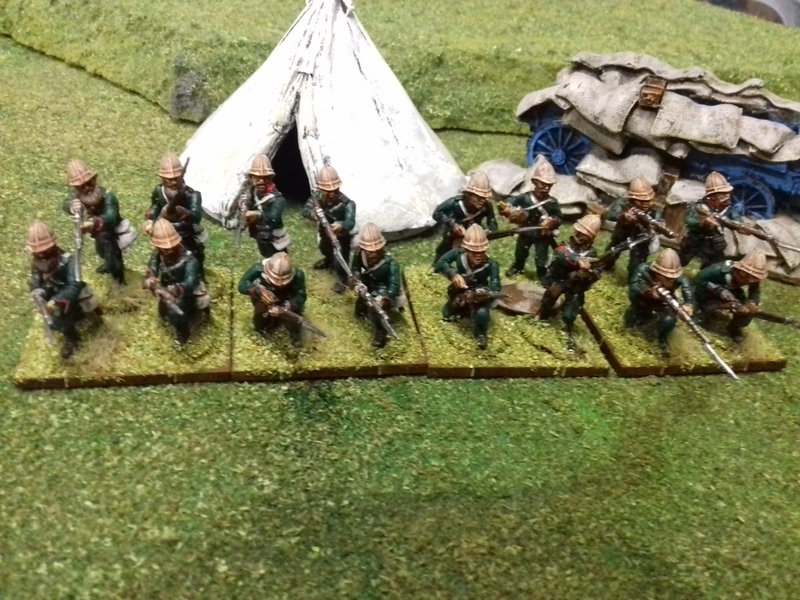 These scouts were attached t0 the 90th regiment, 6 men to each company and served to the end of the war. 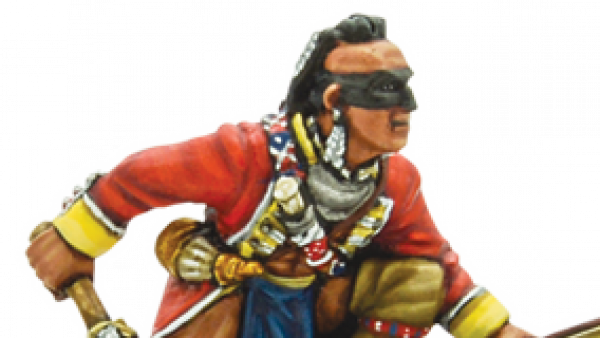 The only occasion I can think of when native troops wore red coats along side the line infantry. 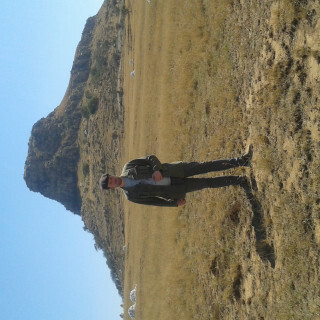 Some holiday snaps at the battlefields. 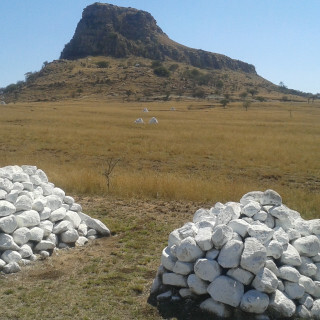 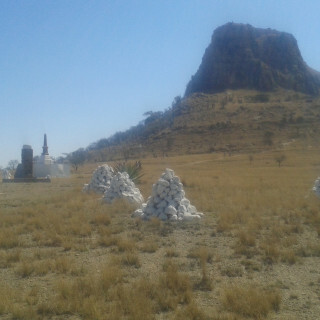 I found Isandlwana to be a very moving sight littered with the white cairns marking the burial sights of the fallen. 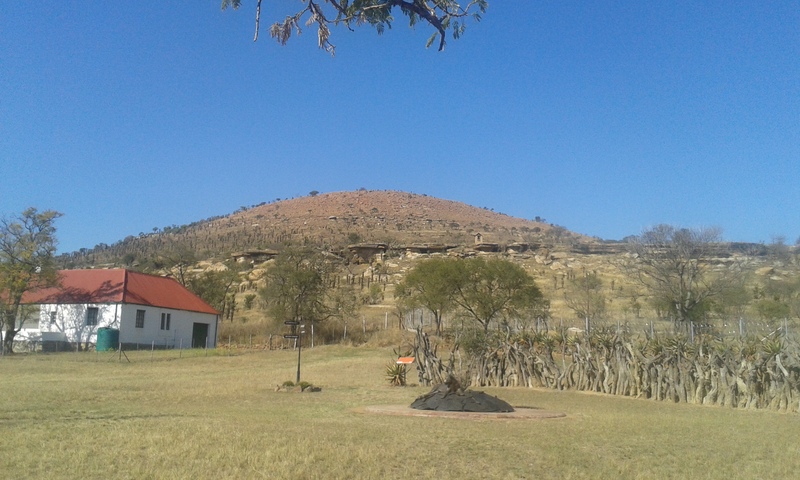 The men were buried were they fell so you get an interesting perspective of how the battle flowed. 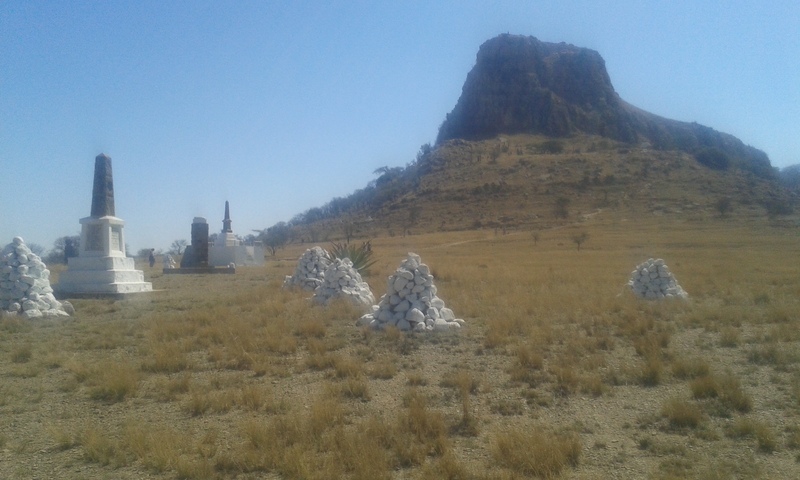 The larger the cairn the more bodies are buried beneath so you can see where the last stands took place. 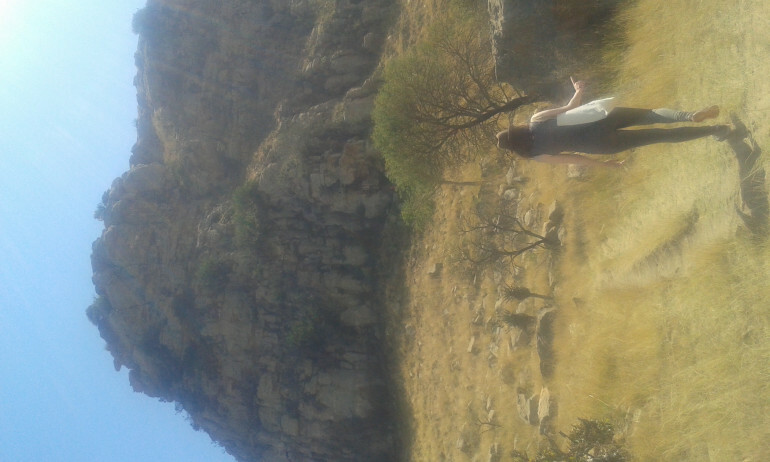 Up the rock slope to the cave where one wounded redcoat took shelter and may have been the last soldier to be killed. 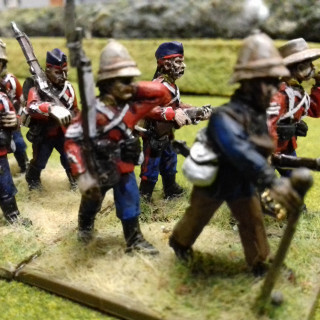 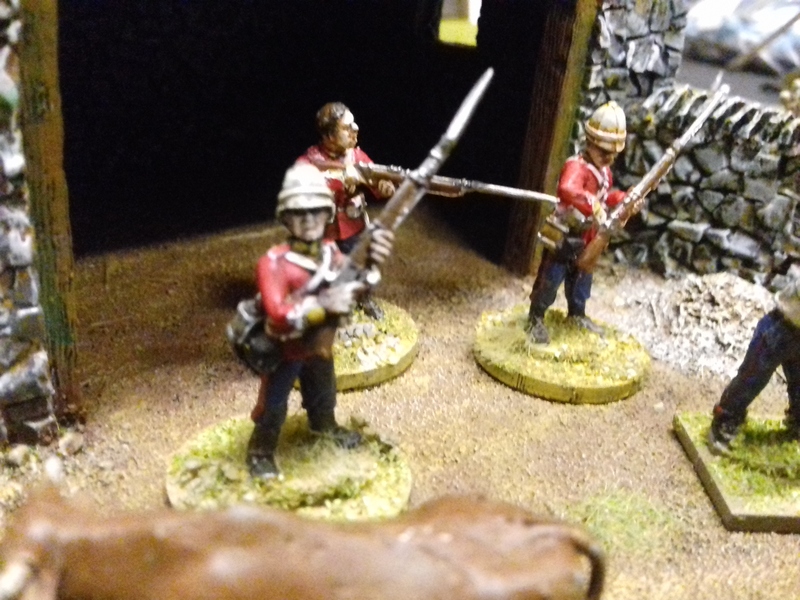 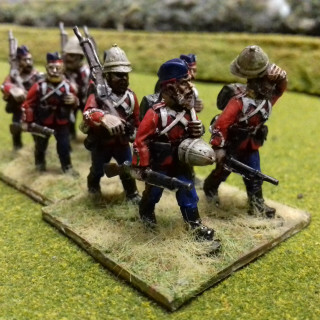 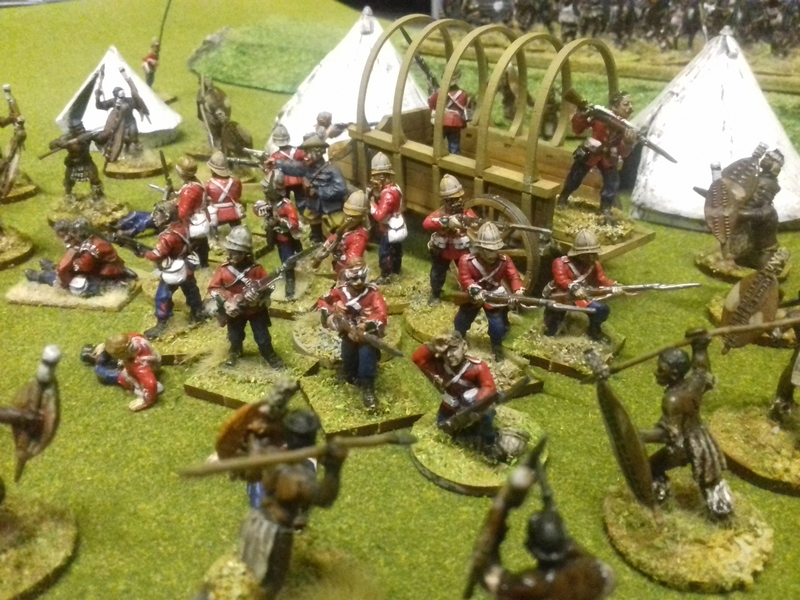 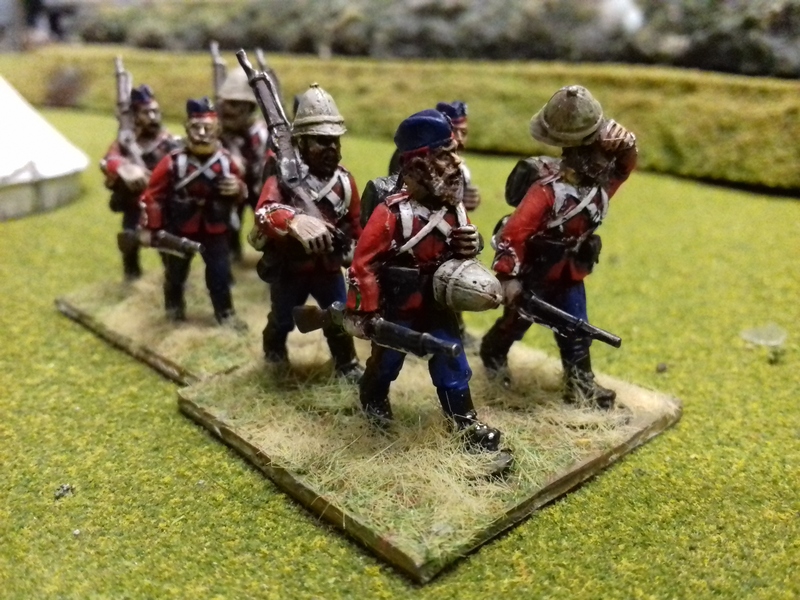 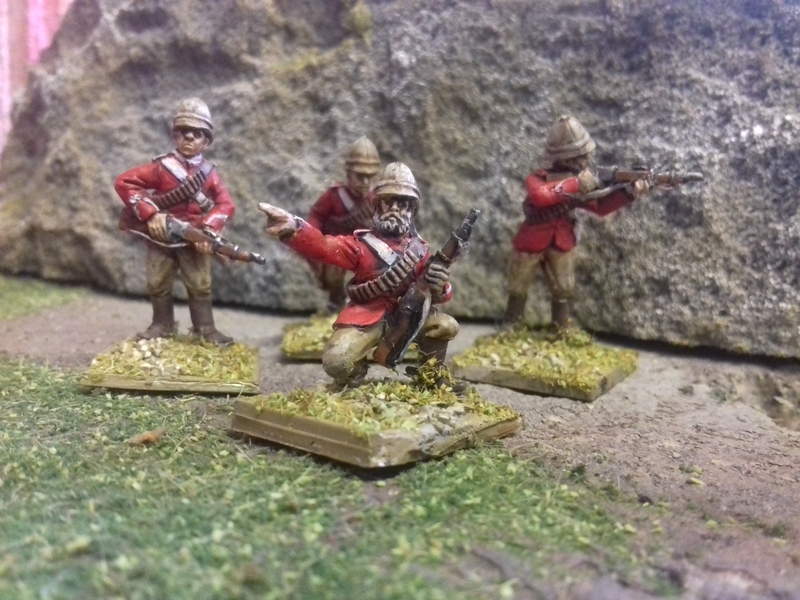 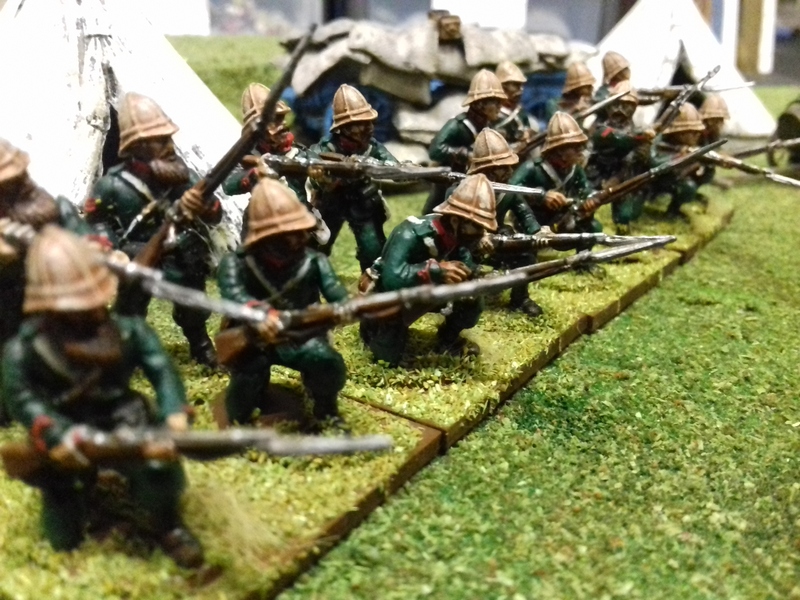 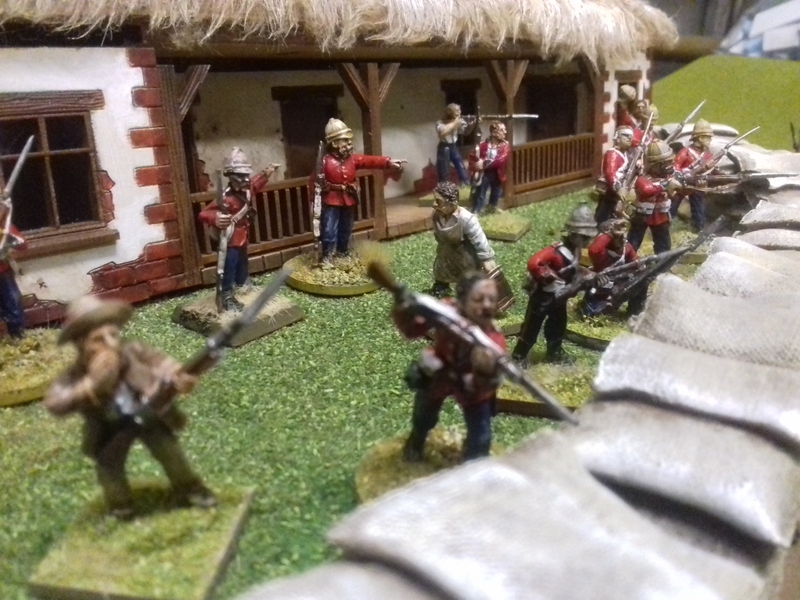 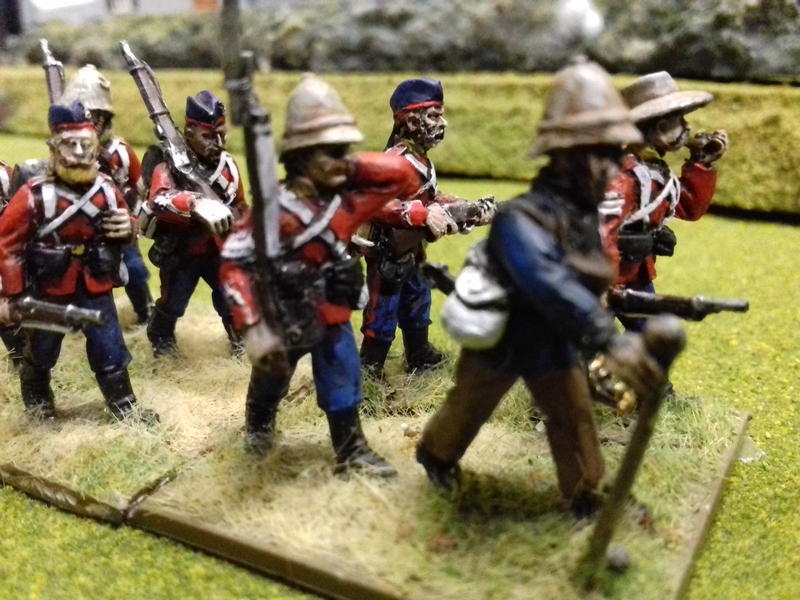 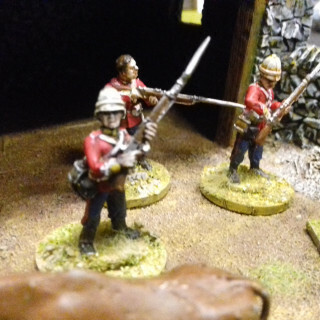 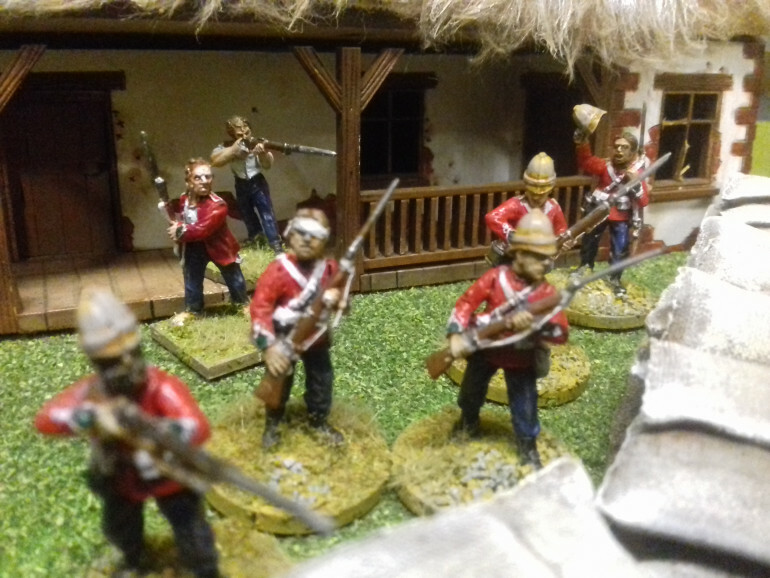 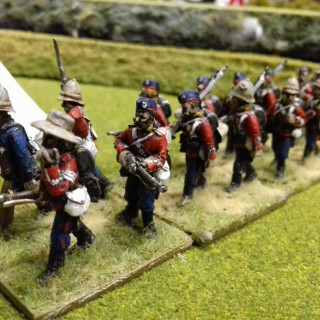 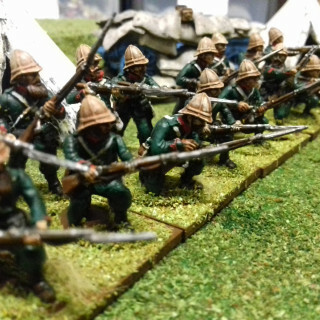 The 24th Regiment of foot is the most well known line unit to take part in the Zulu War thanks to its participation in the two most famous battles of the war. 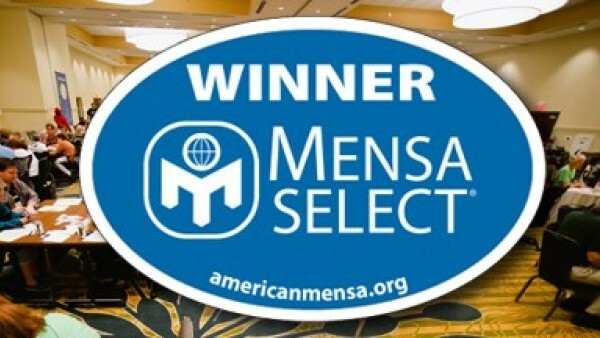 With completely opposite results. 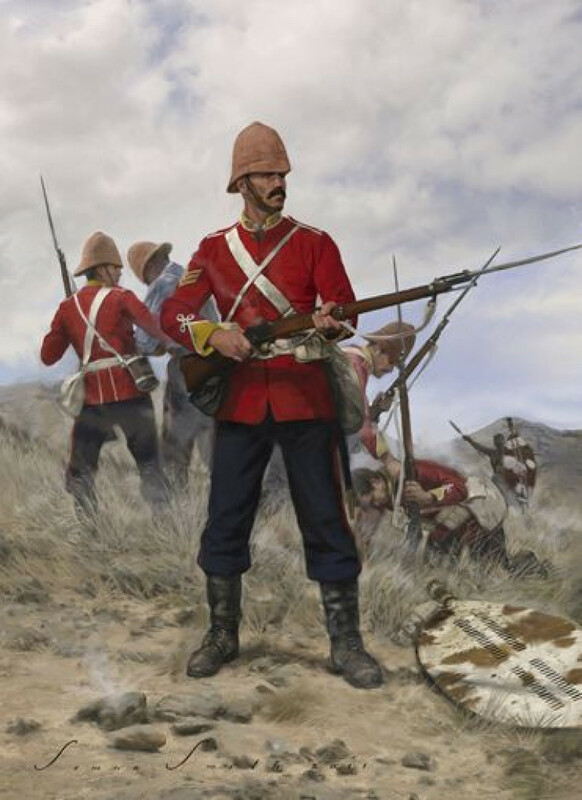 When the British army invaded Zululand the 24th was to accompany the 3rd column led by Brevet Colonel Glynn. 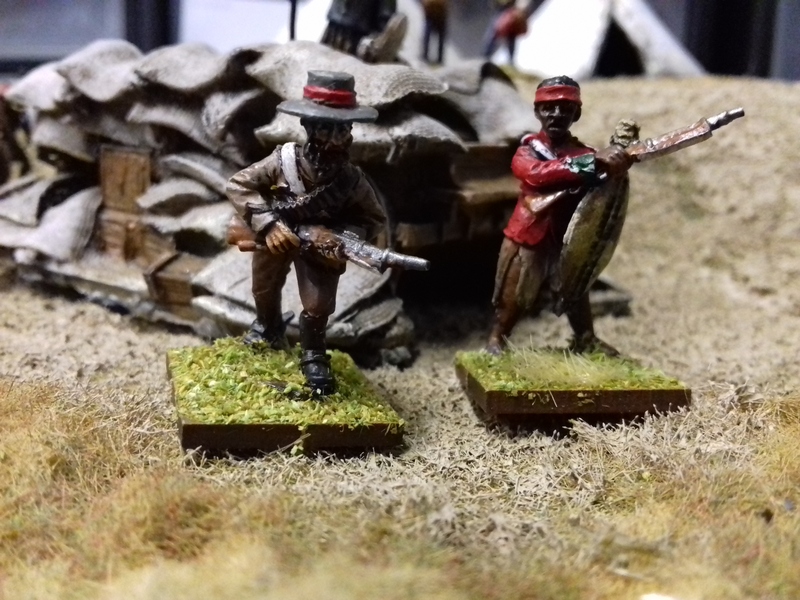 The 1st and 2nd battalion were apart of the main thrust into Zululand in an attempt to draw out the Zulu army into open conflict. 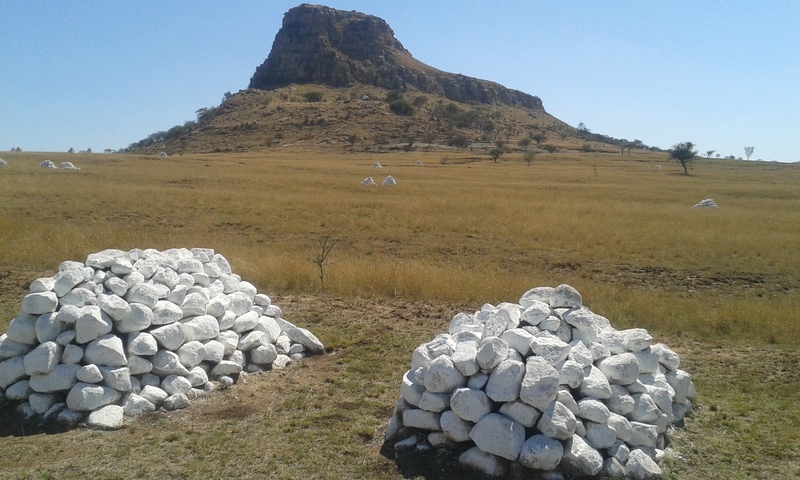 Instead it was the British camp that was surprised at Isandlwana when the split force in camp was overwhelmed and wiped out. 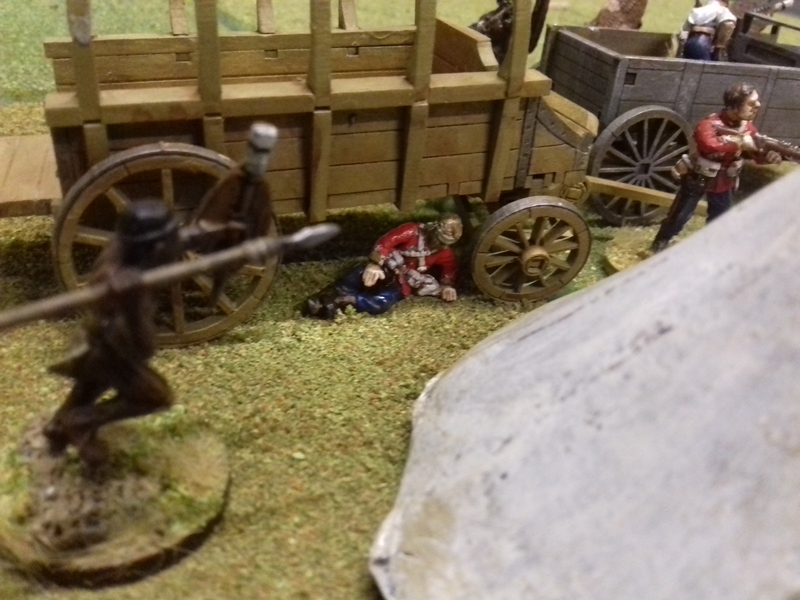 The colours were taken to safety but lost a fugitives drift and found days later stuck in the rocks. 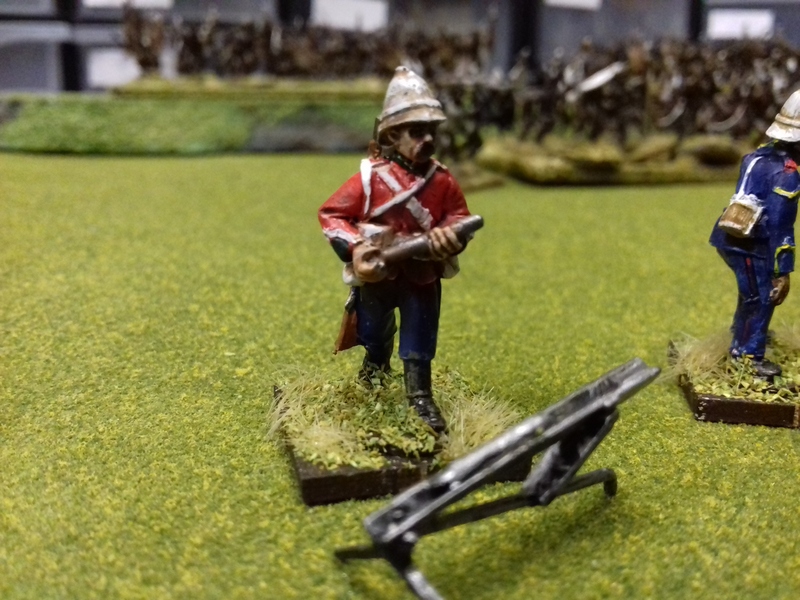 No red coated soldier survived the massacre. 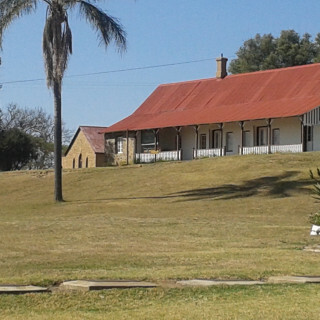 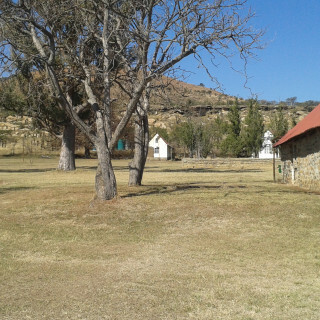 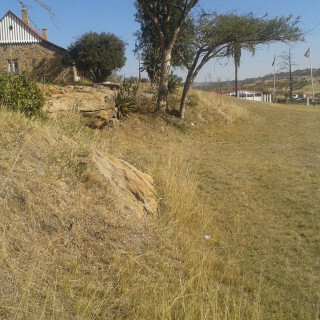 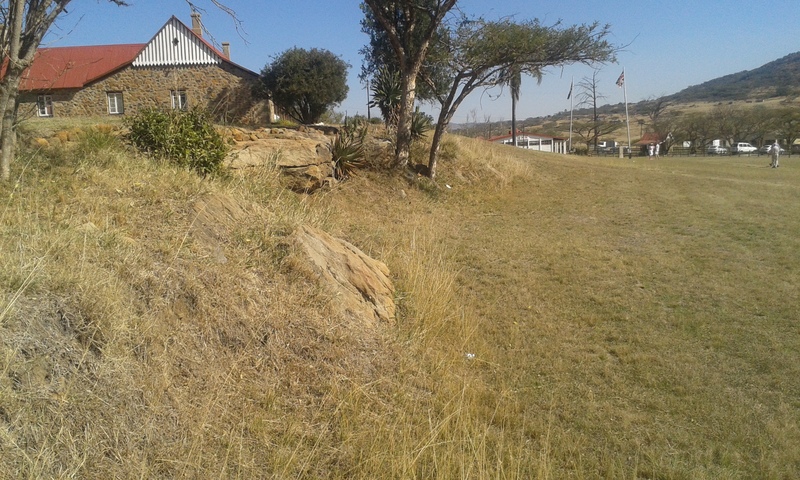 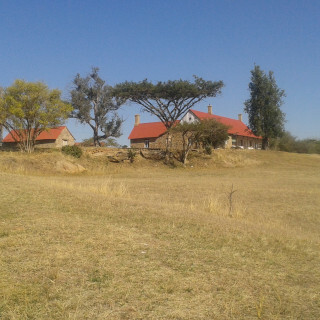 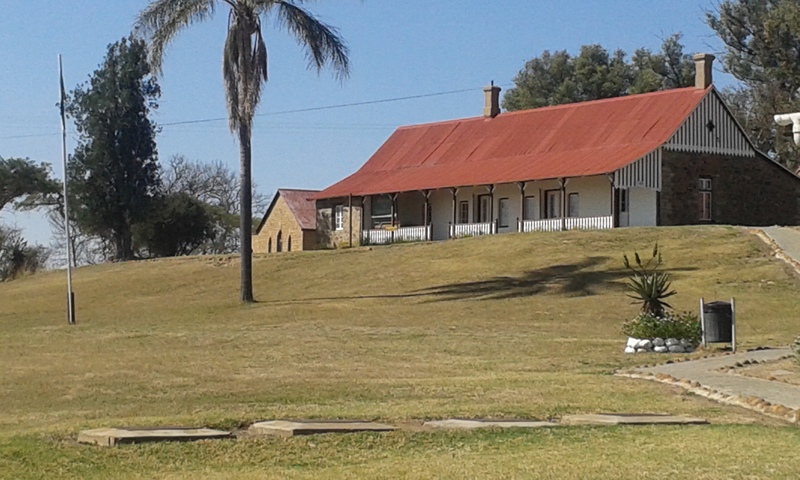 Members of B company had been left just over the border in Natal at the storage depot and hospital at Rorkes Drift. 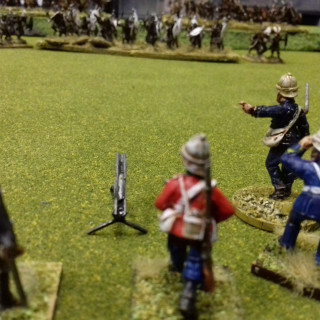 The defence their is stuff of legend with members of the 24th wining 7 of the eleven VCs that day. 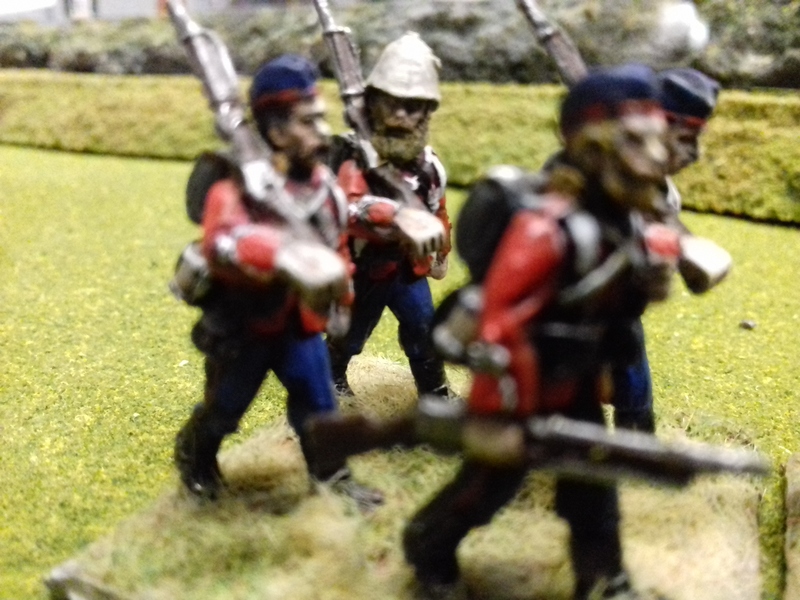 Despite the heroism the regiment was devastated by the loss and it would be up to other line regiments to carry on the fight. 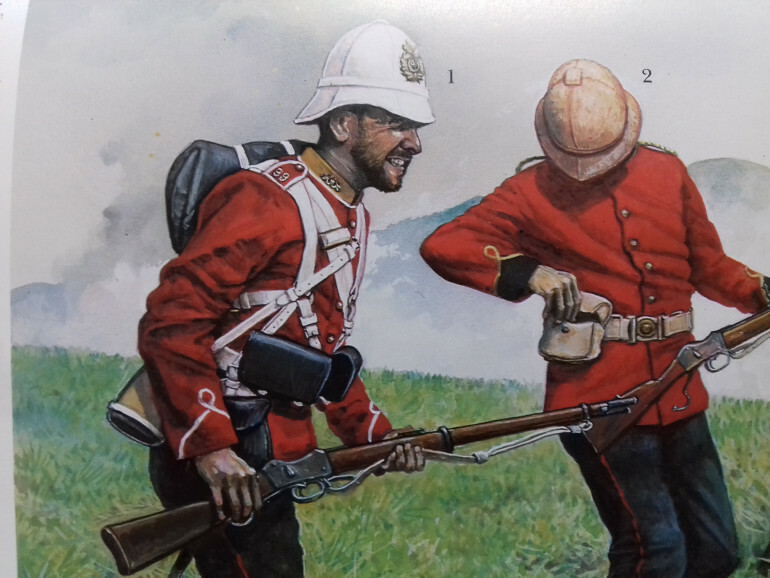 Like all line regiments they wore red coats but with dark green cuffs and the usual equipment such as the Martini Henry rifle. 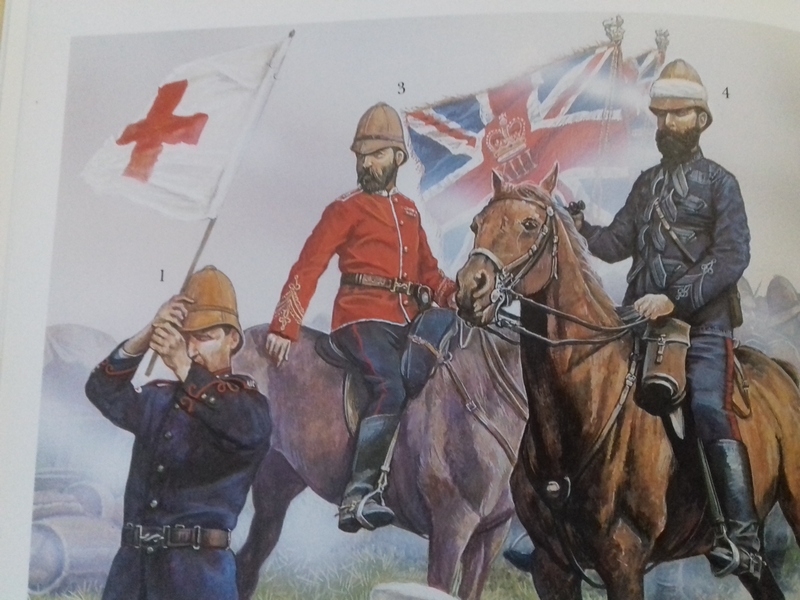 The white helmet had only come in a few years earlier but on campaign the badge was removed and it was stained with tea. How effective this camouflage was for a soldier in red with white equipment I often wonder. 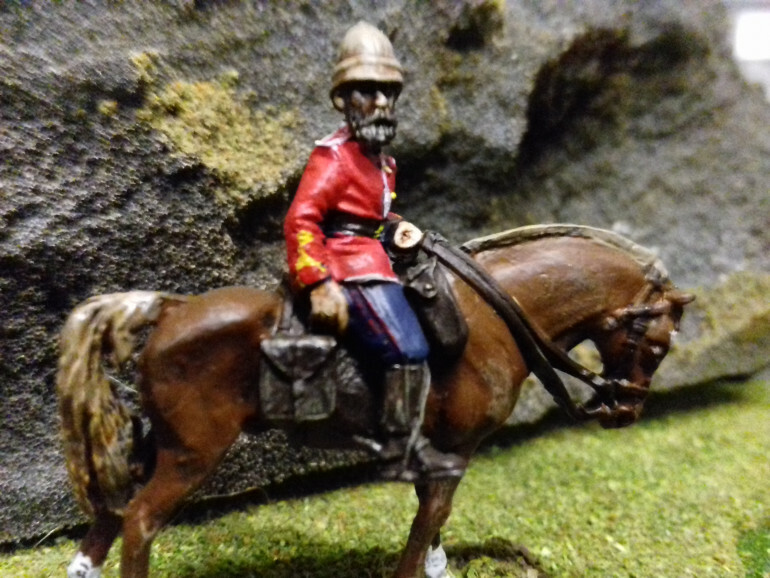 The Frontier Light Horse was raised to serve in the Ninth Cape Frontier war of 1877. 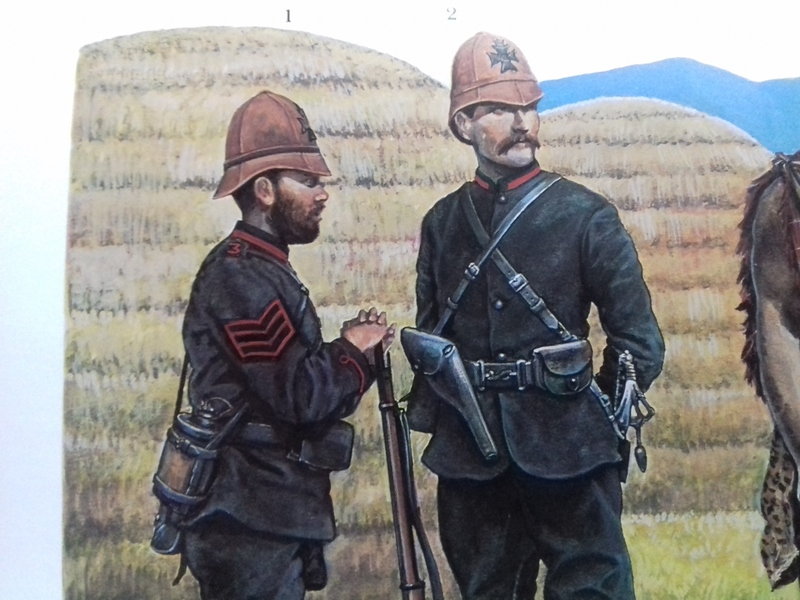 They were made up of various adventurers of Empire and were paid five shillings a day compared to the 1 shilling earned by infantry. 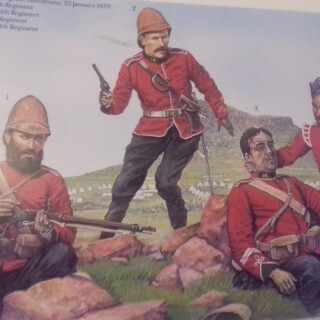 During the Zulu war they were commanded by Major Buller and formed three troops each consisting of 60 men and 9 officers and NCOs. 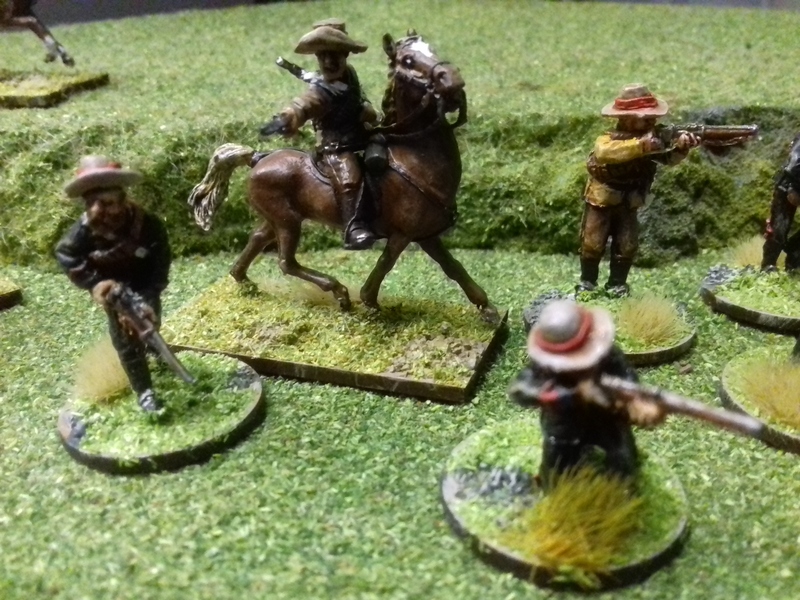 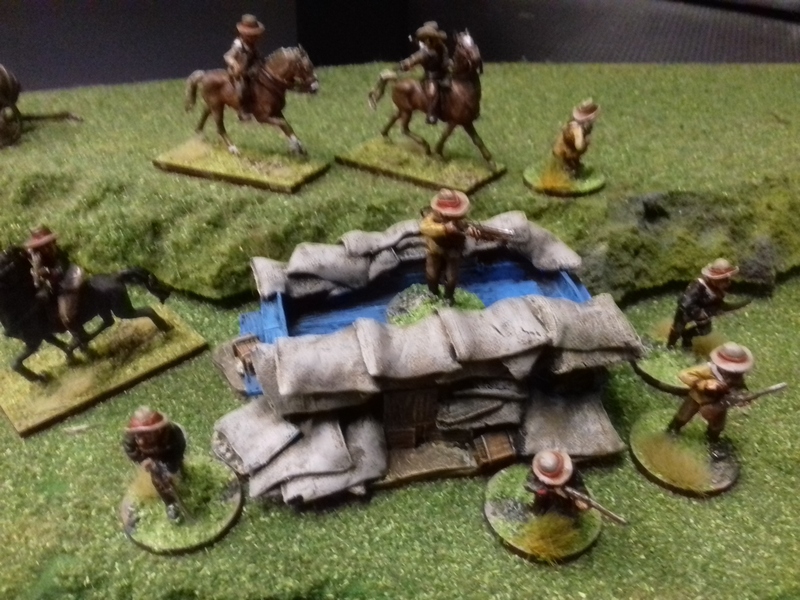 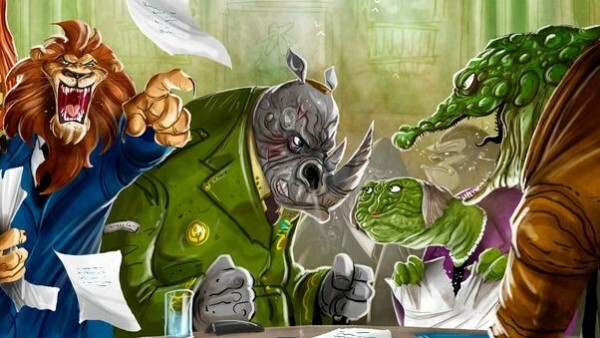 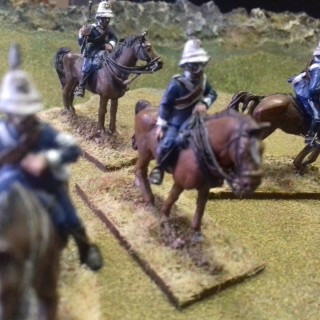 From a gaming point of view they can be represented on the table by their colour coordinated horses. 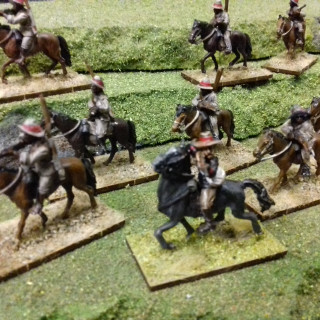 A troop had bays, B troop chestnuts and C troop Greys. 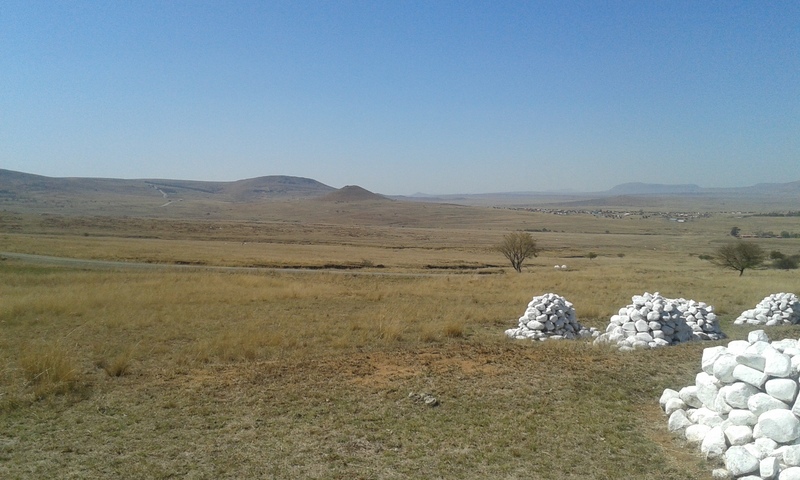 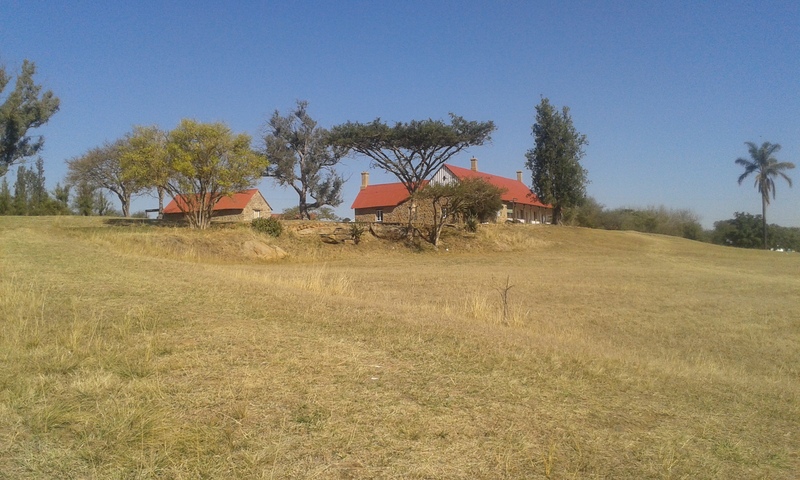 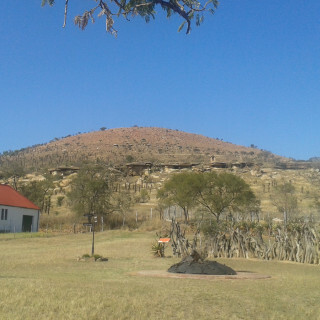 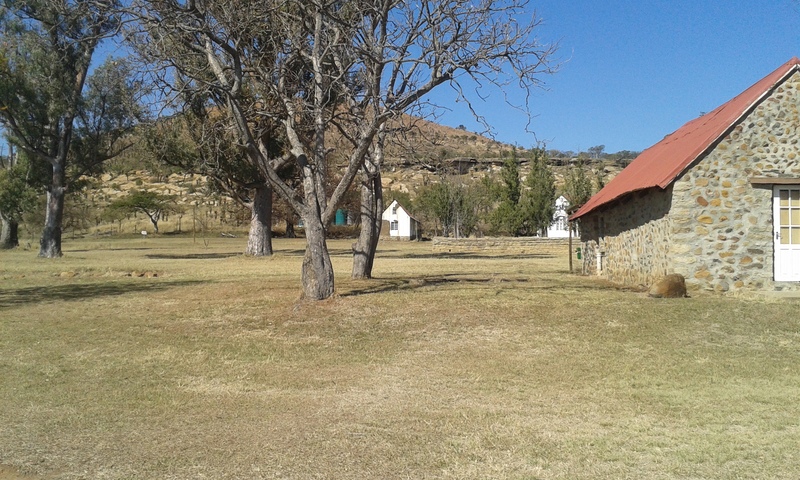 Buller passed command to Colonel Barton who would be killed at Hlobane where a number of the FLH saw action. 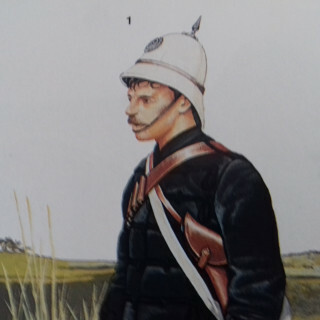 Uniforms were of a mix of black and buff cotton cord suits with red or black facings. 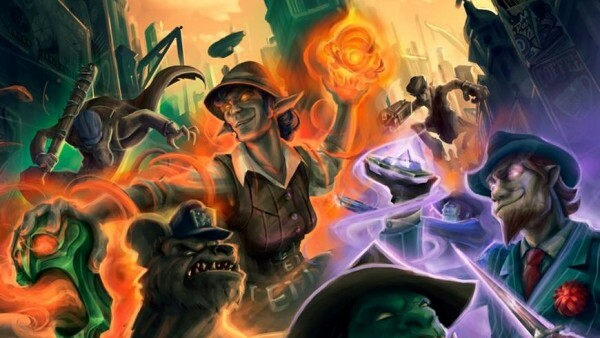 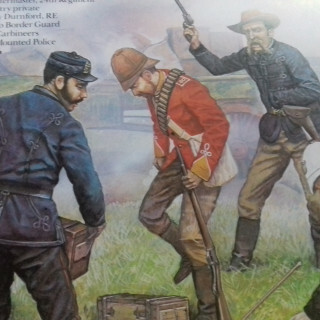 They wore wide brimmed hats known as smashers. 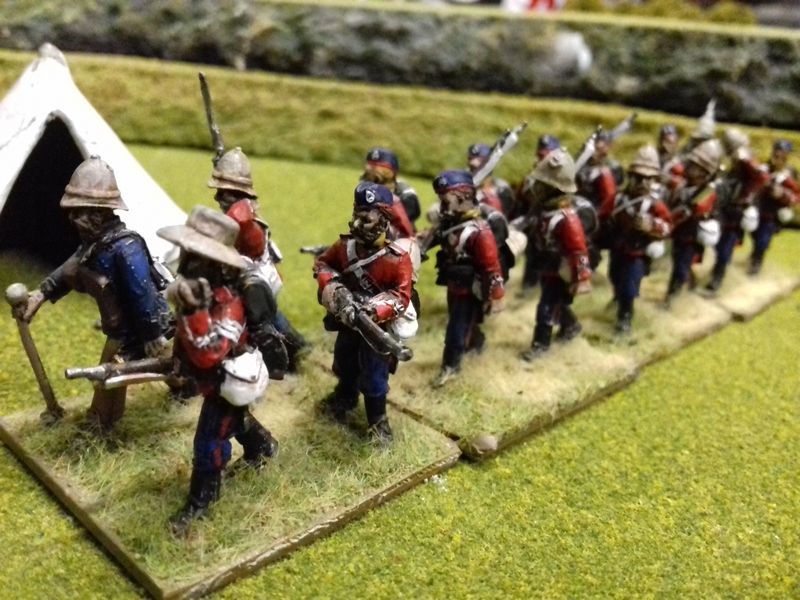 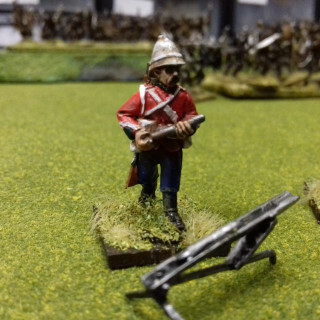 Not all British infantry wore red during the campaign. 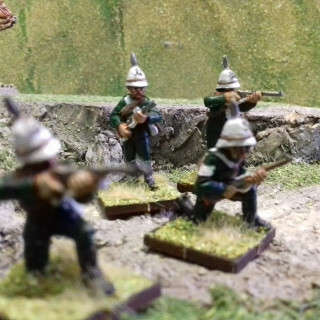 The 60th rifles still wore their traditional green with black webbing. 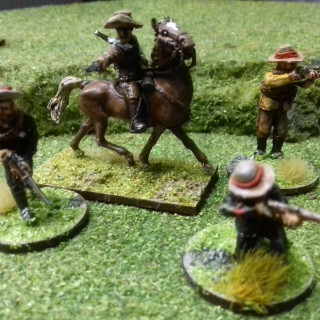 The green would appear black on the field after awhile. 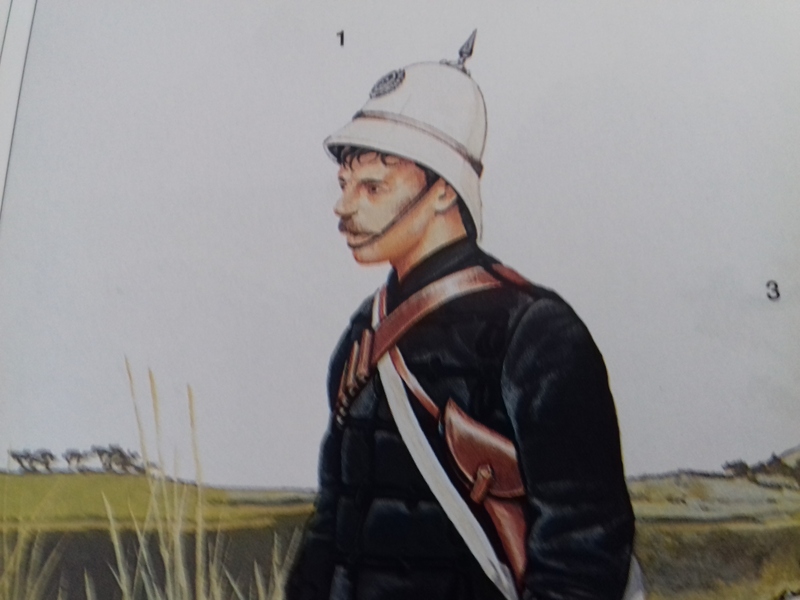 The sun helmet was dyed brown but unlike other infantry they kept the cap badge on. 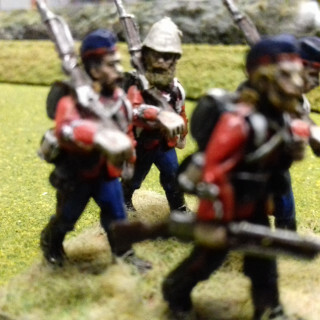 It was made from a dark metal so didn’t glint as other infantry badges did. 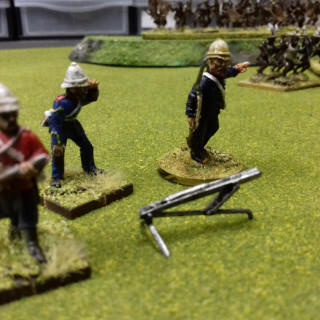 They were armed with the Martini Henry Rifle but unlike other infantry had the longer sword bayonet. 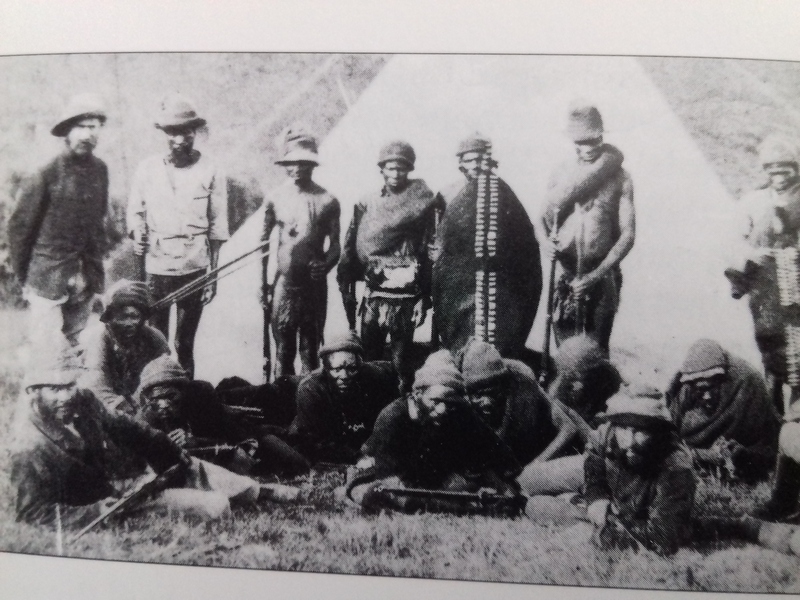 They arrived after the disastrous start to the war and helped in the relief of Eshowe. 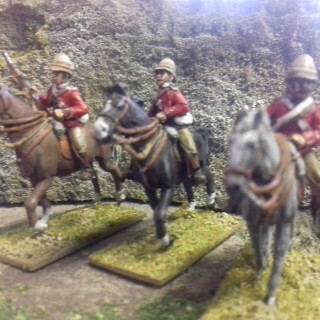 Five Troops of African horseman was proposed before the war began. 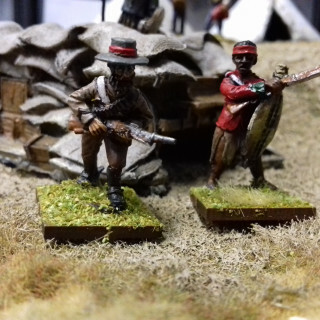 An enthusiastic response from the amaNgwane people of the foothills of the Drakensburg Mountains meant they ended up with six Troops. 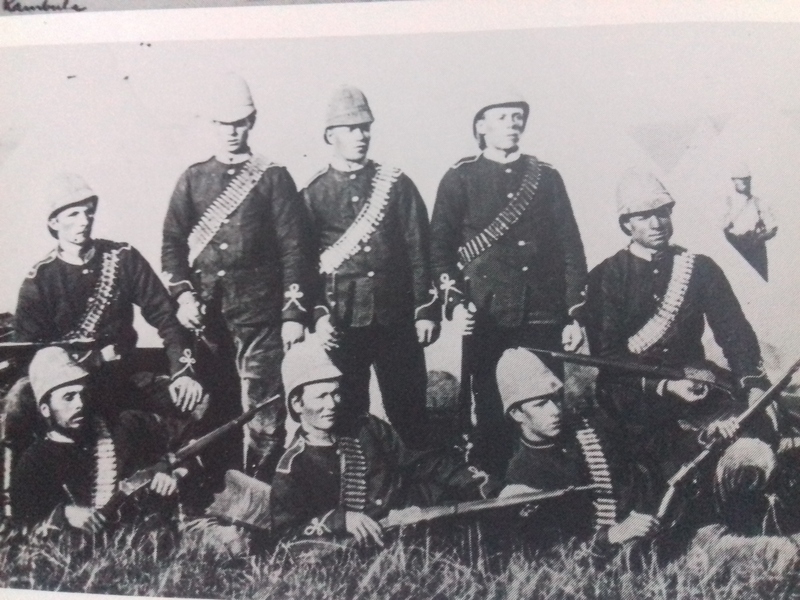 They were led by white officers and known as the Natal Native Mounted Contingent totalling over 300 men. 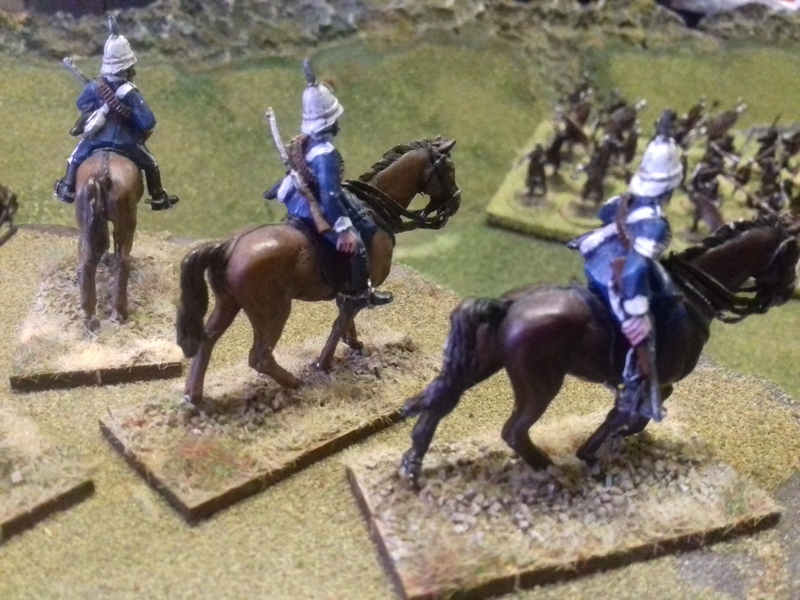 Unlike native infantry the cavalry were all armed with modern rifles. 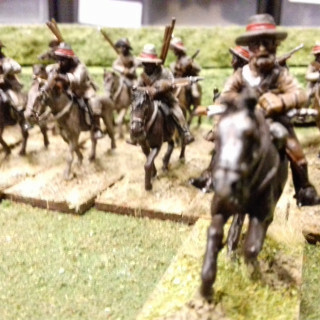 They had to provide their own horse but if it was killed would receive £10 compensation. 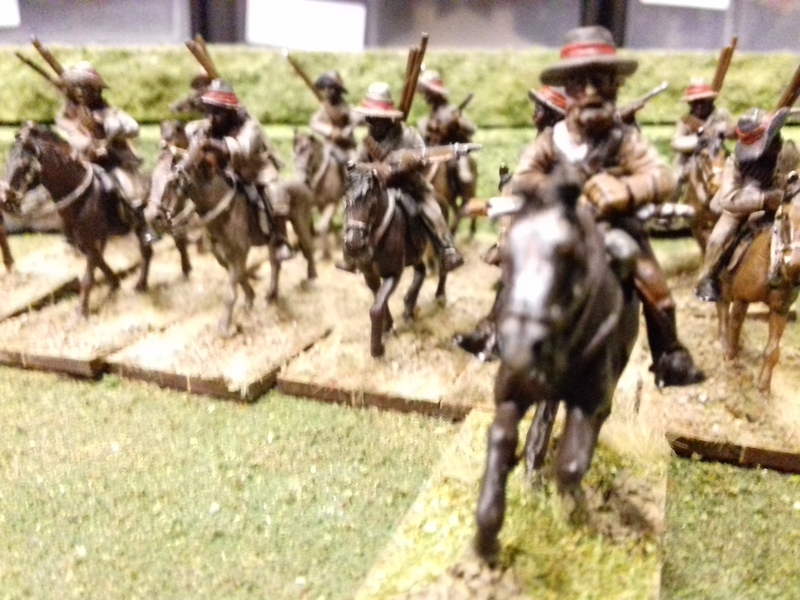 Troopers were supplied with cord uniforms and boots but many decided to ride bare foot. 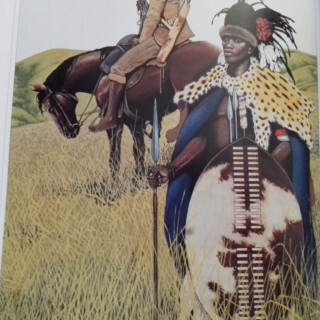 Five Troops were involved around Isandlwana and after the defeat disbanded. 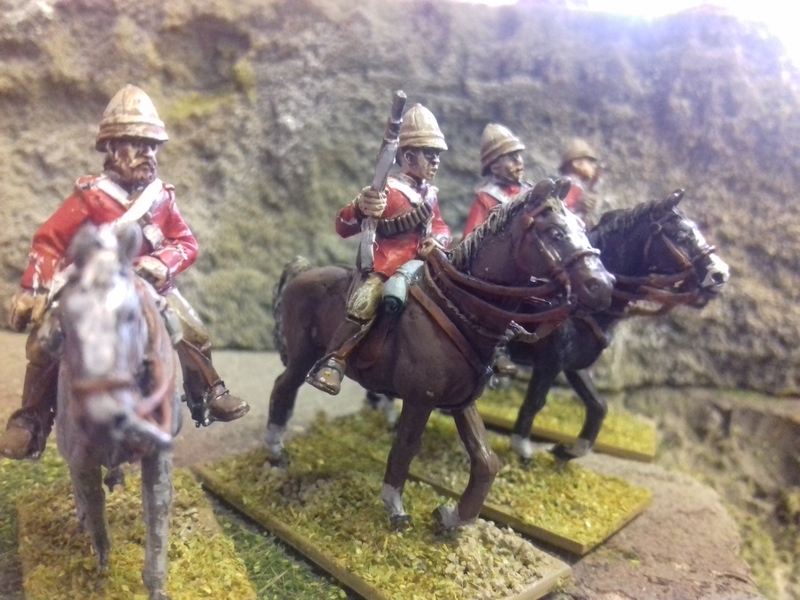 They would after reform as the Natal Native Horse and each troop was usually known for the tribe it came from or it’s commanding officer such as Shepstones Horse. 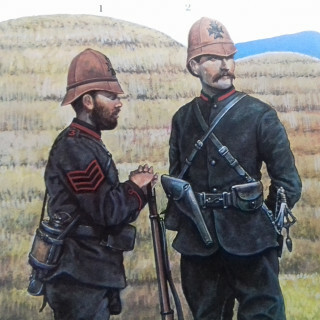 They would be involved in many of the major engagements later in the war. 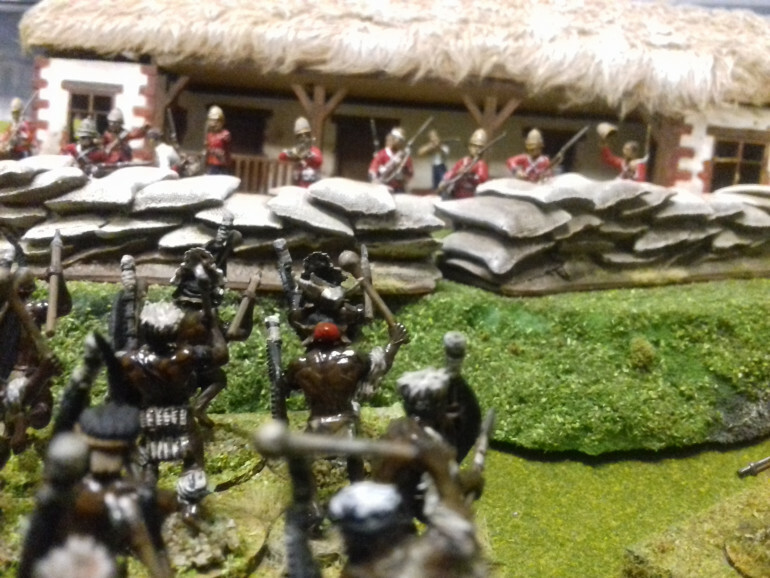 The British began raising the local native tribes to take on their enemy Zulu neighbours. 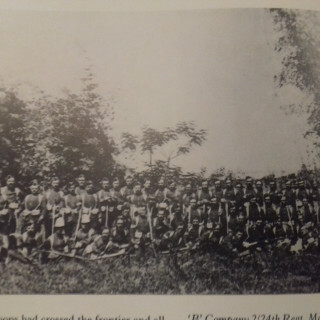 The Natal Native Contingent or NNC consisted of ten companies of 1,100 officers and men. 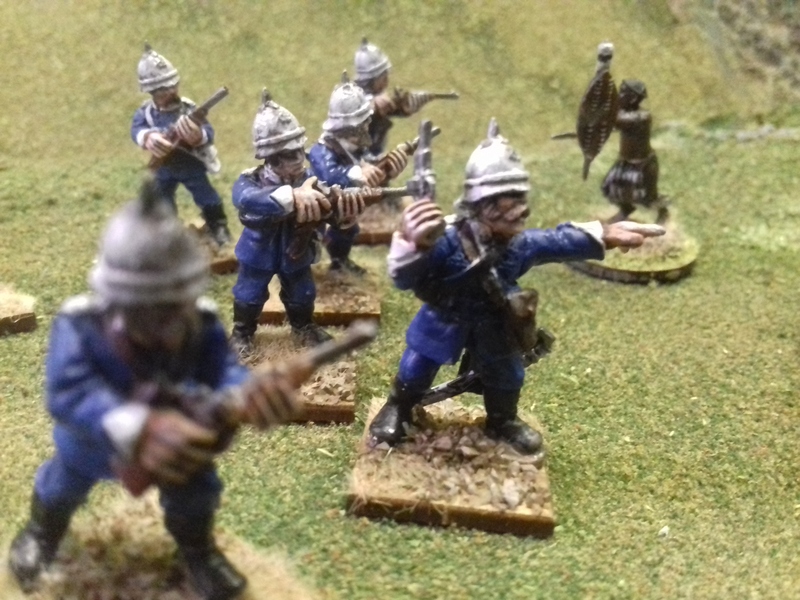 A group of European officers and NCO’s led each battalion. 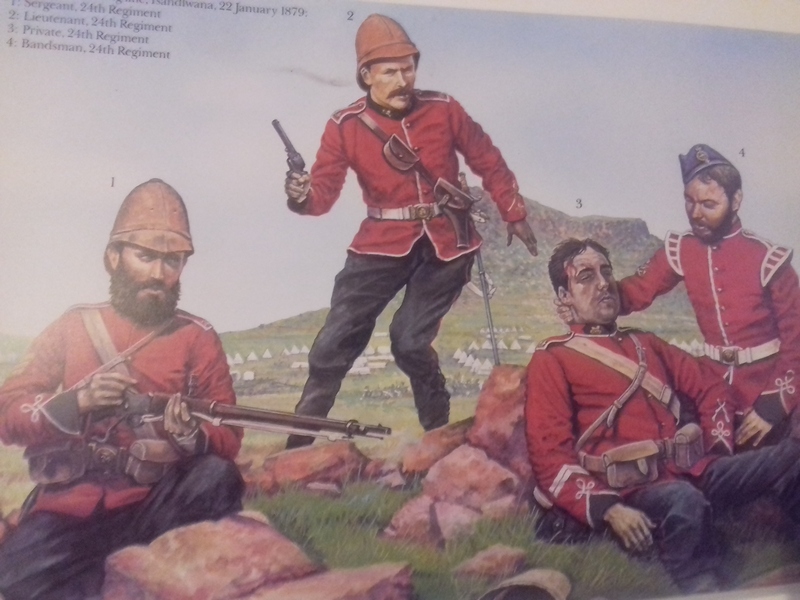 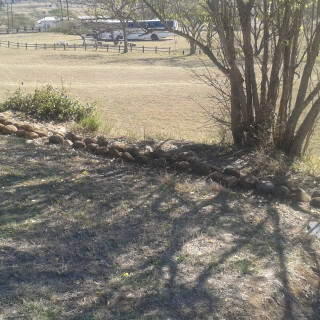 One such NCO was Corporal Schiess who was awarded the Victoria Cross at Rorkes Drift where he was a patient.Due to the fear of arming the local black population only one in ten were armed with out of date firearms while the rest carried their traditional spears. 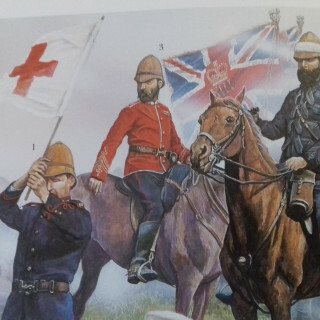 To identify them on the battlefield they wore red head bands and the white officers had a red band on their hats. 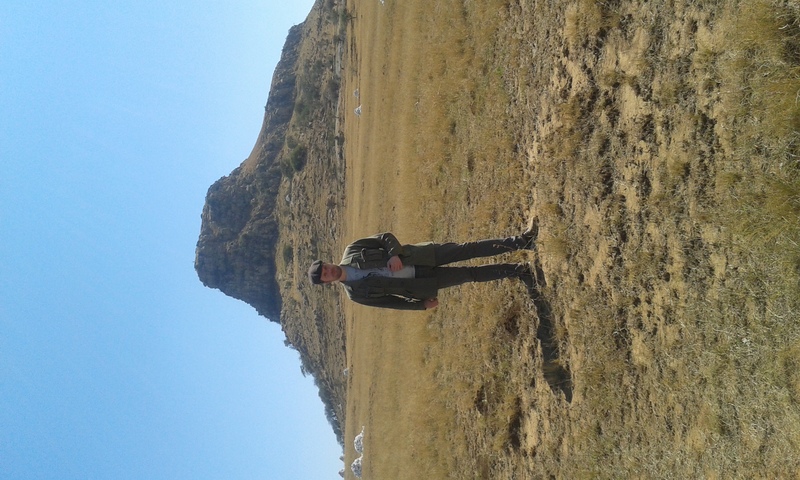 Some did wear cast of european clothing and were given blankets and cloth hats. 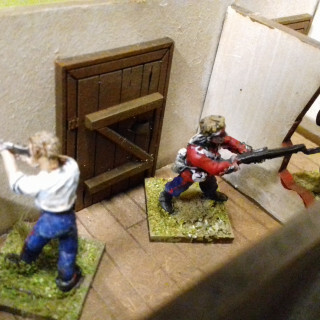 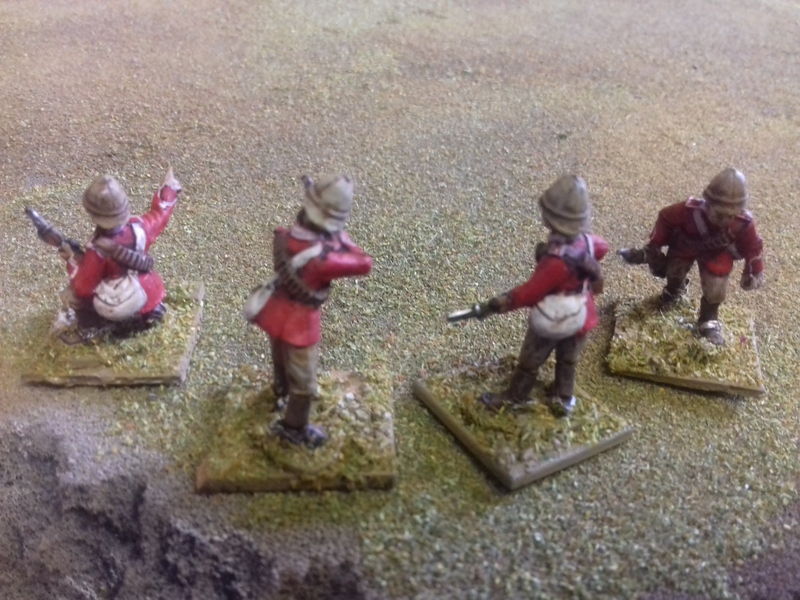 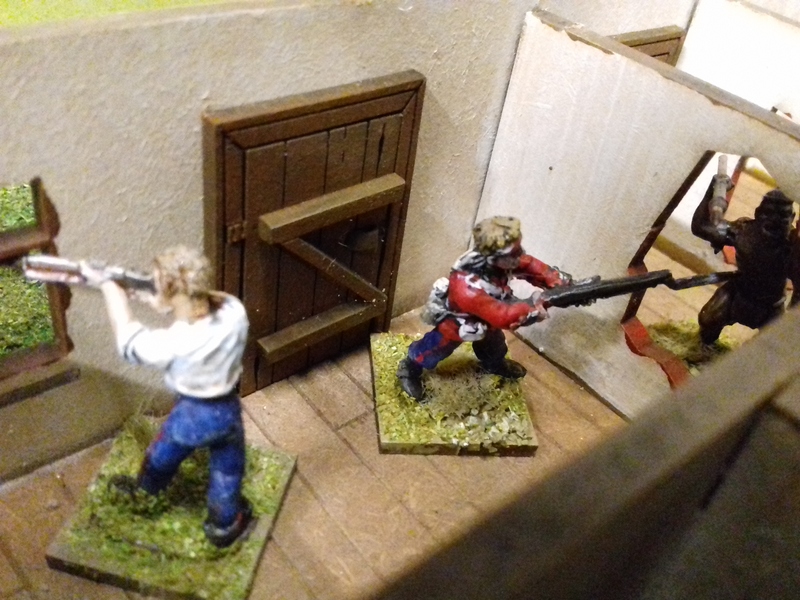 Some formed pioneer units that wore out of date red coats with the regimental facings removed. 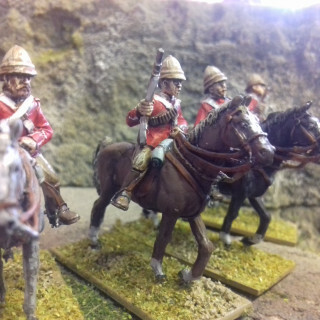 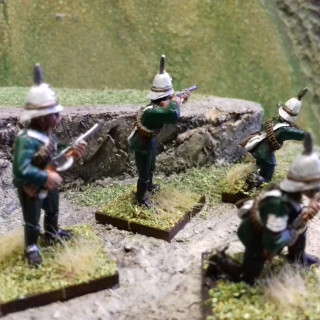 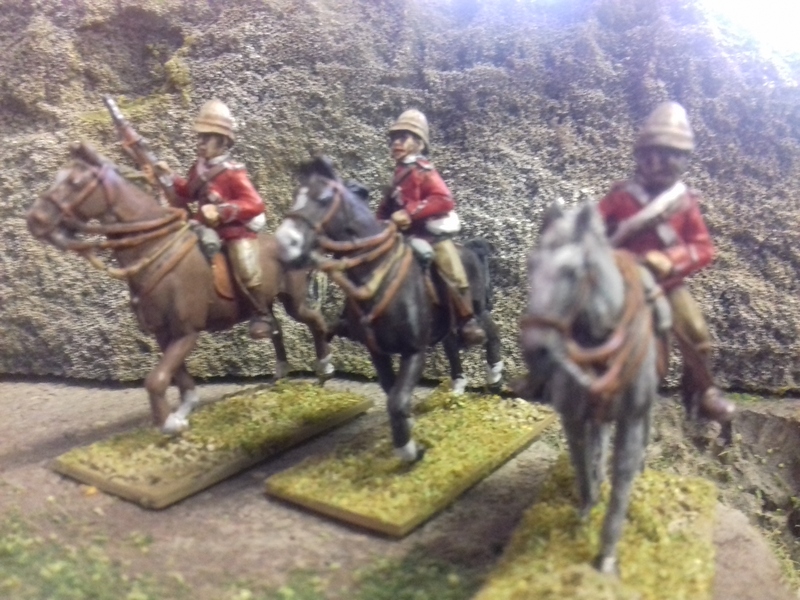 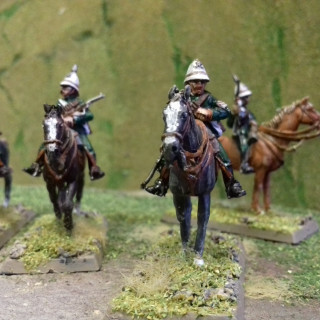 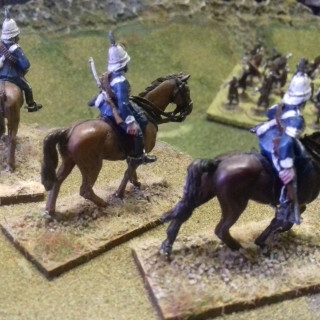 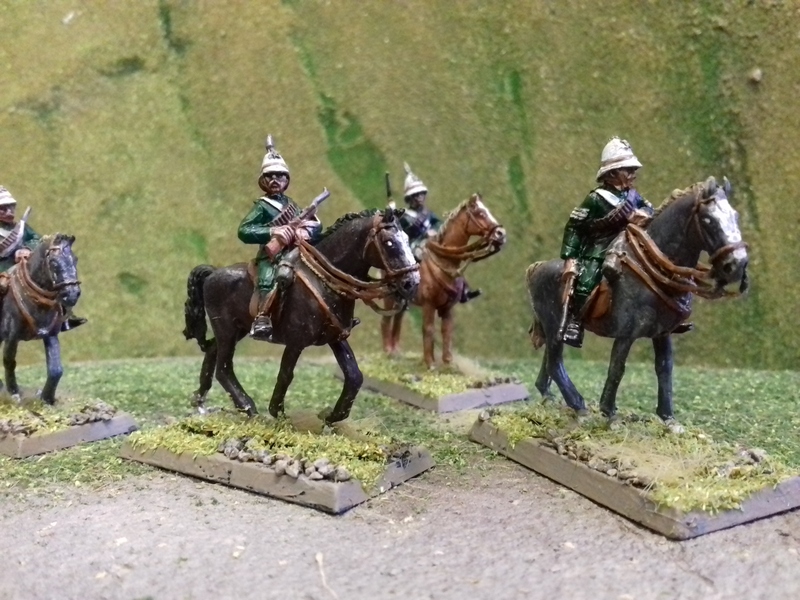 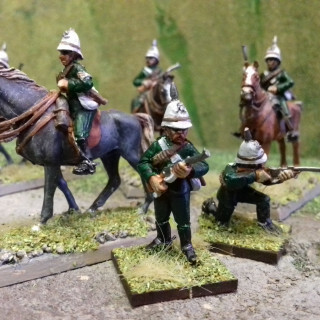 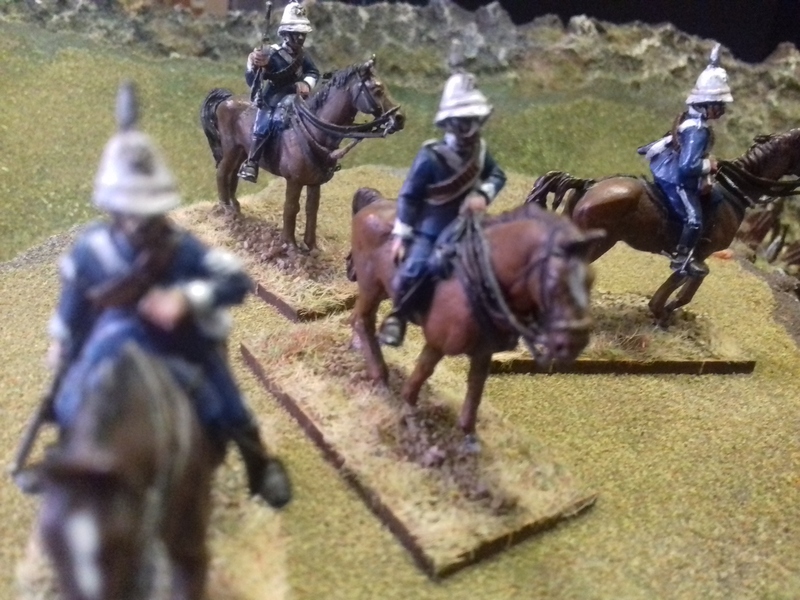 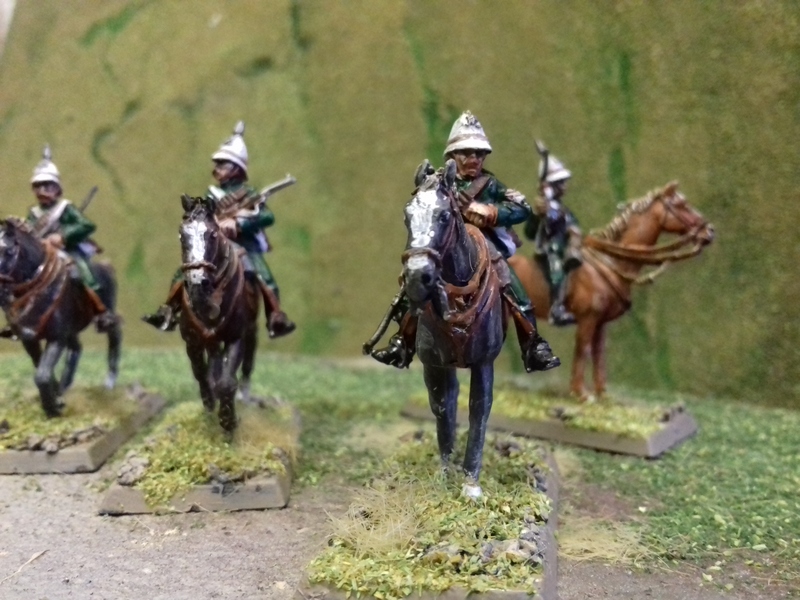 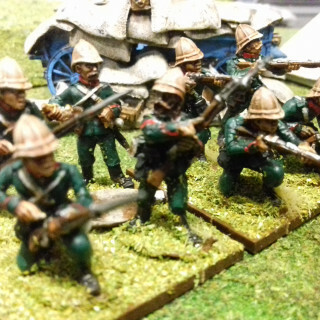 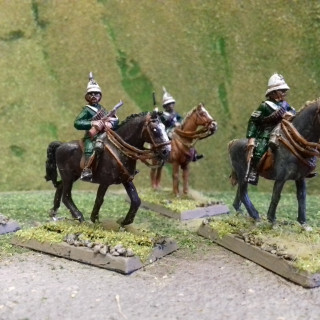 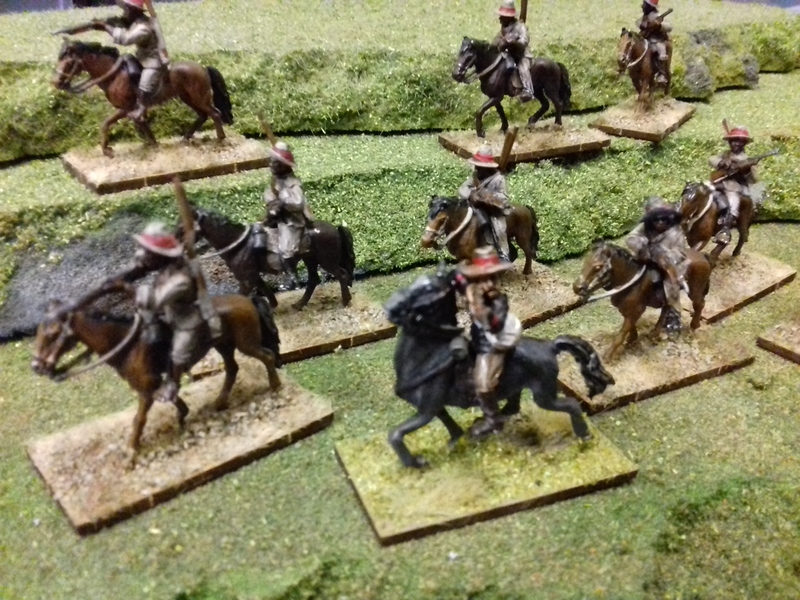 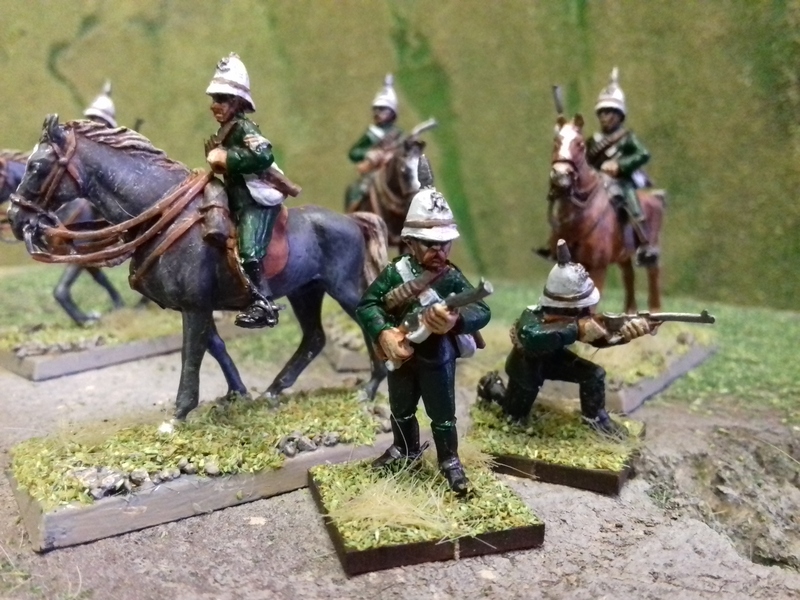 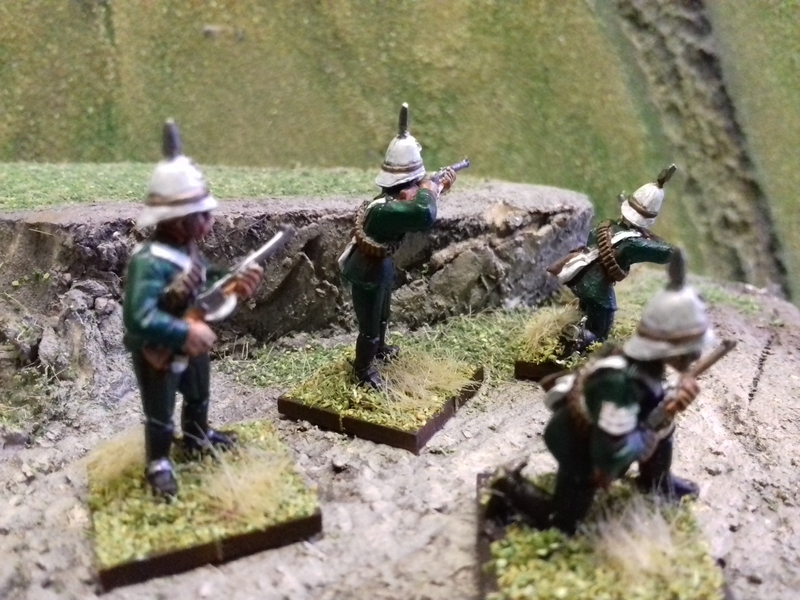 Due to a lack of cavalry units available in Zululand the British Army created mounted infantry units. 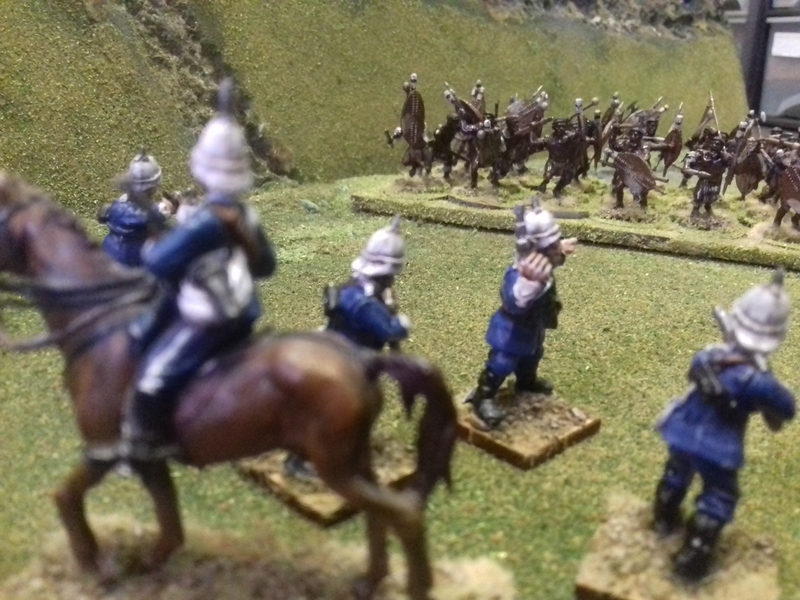 They gathered troops from the regular infantry battalions. 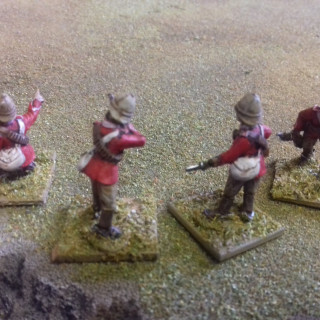 They kept their red coats but wore riding breeches and ammunition bandoliers. 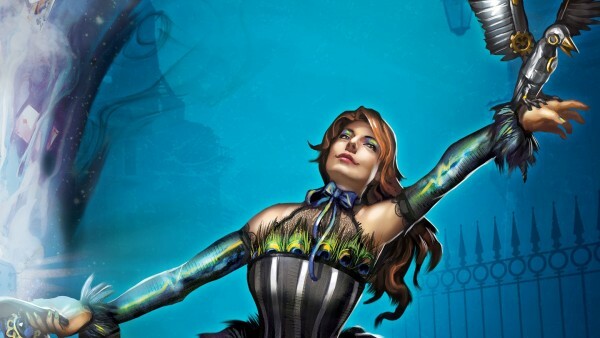 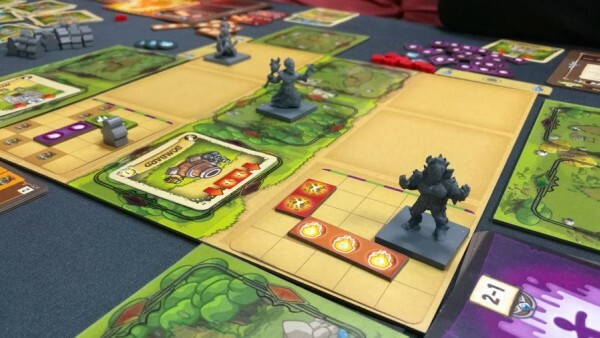 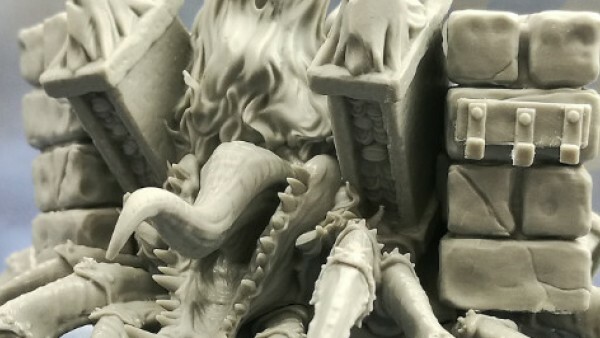 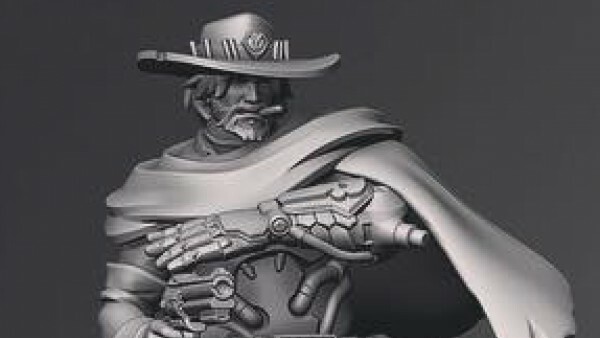 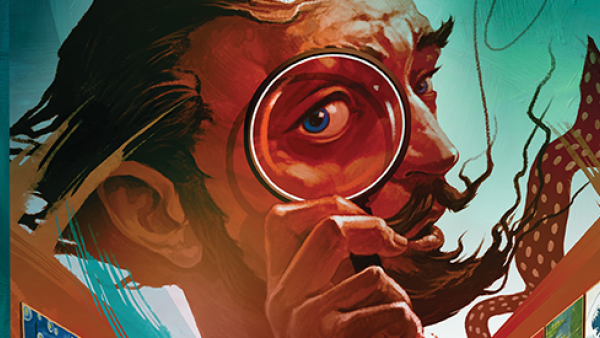 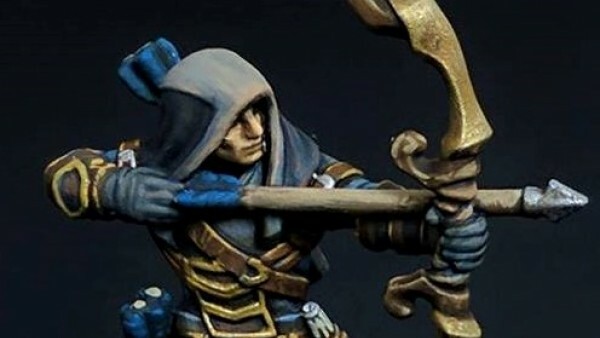 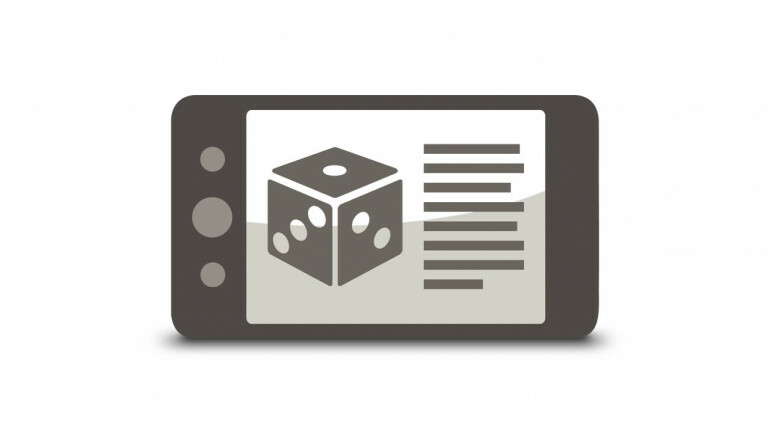 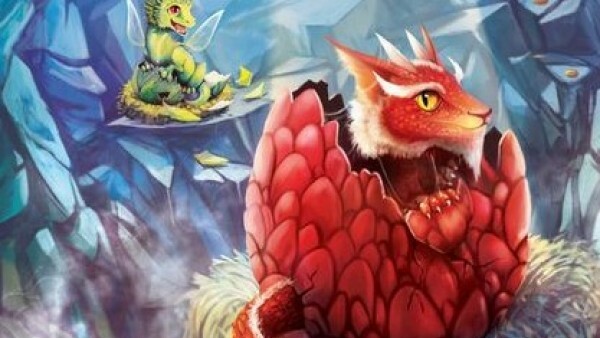 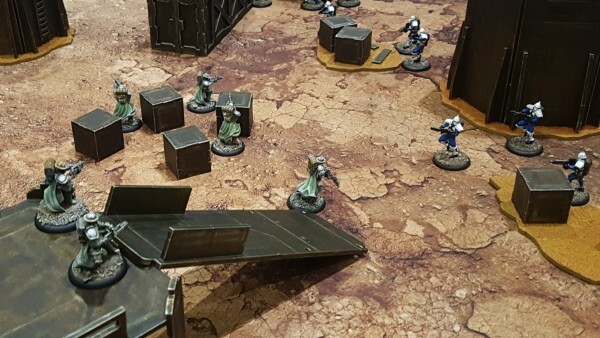 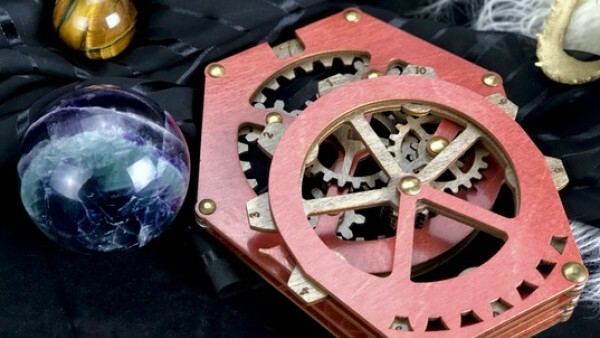 This sets them apart on the tabletop. 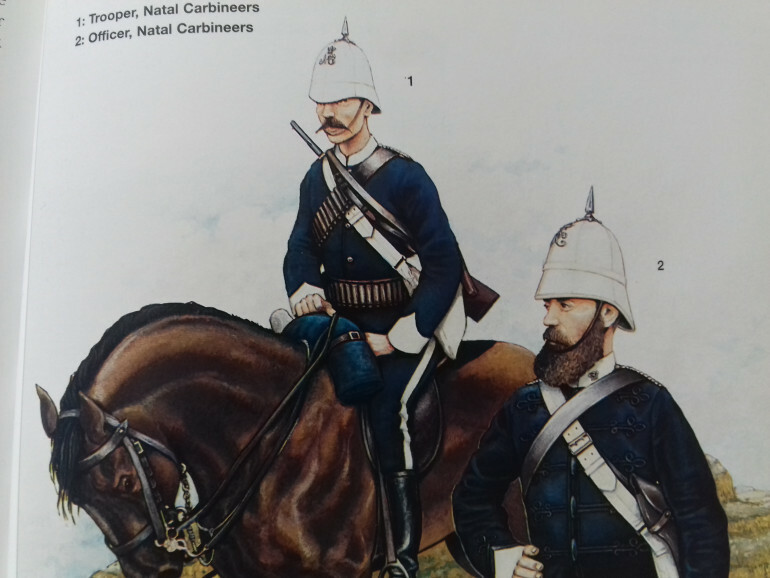 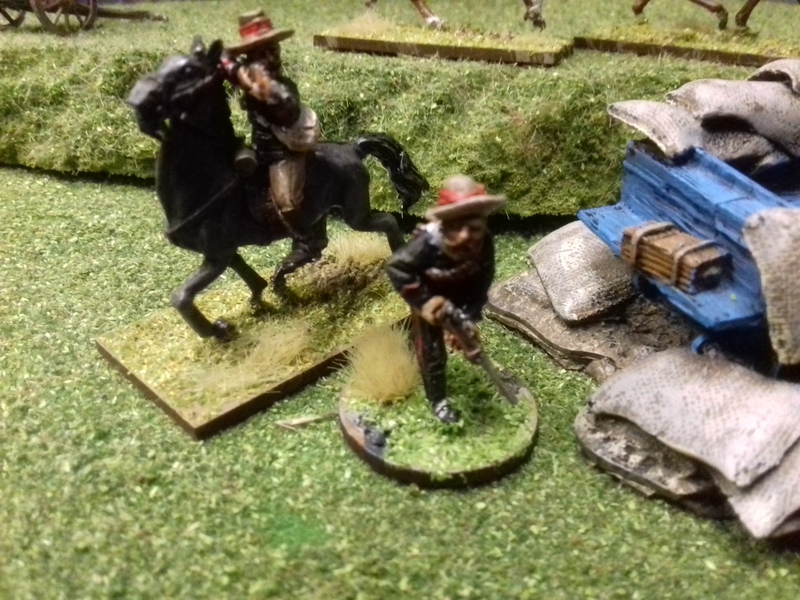 Formed in 1865 the Natal Hussars were one of eleven mounted volunteer units formed to protect the colony when British regulars were not available. 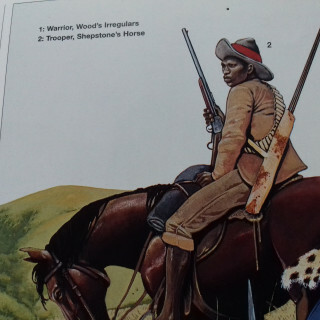 They had to purchase their own horse and uniform but the equipment was government paid for. 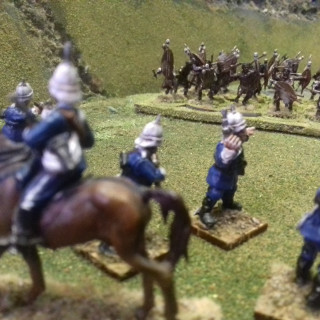 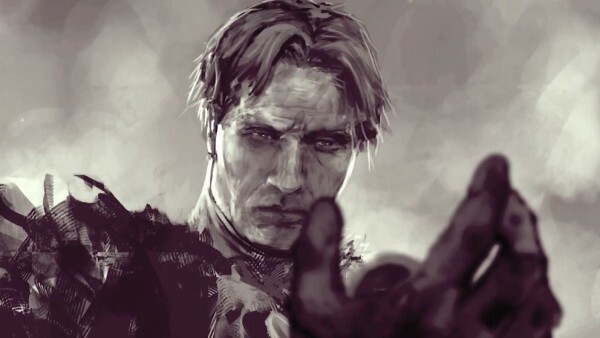 At the start of the war they numbered forty troopers with two elected officers. 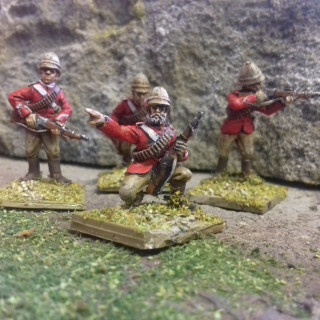 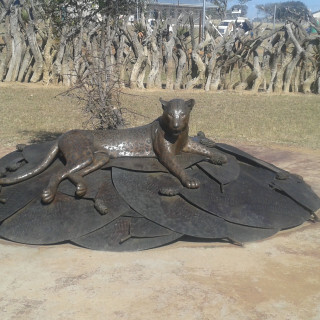 Despite being formed for the colonies defence they joined Colonel Pearsons column during the Zululand invasion. 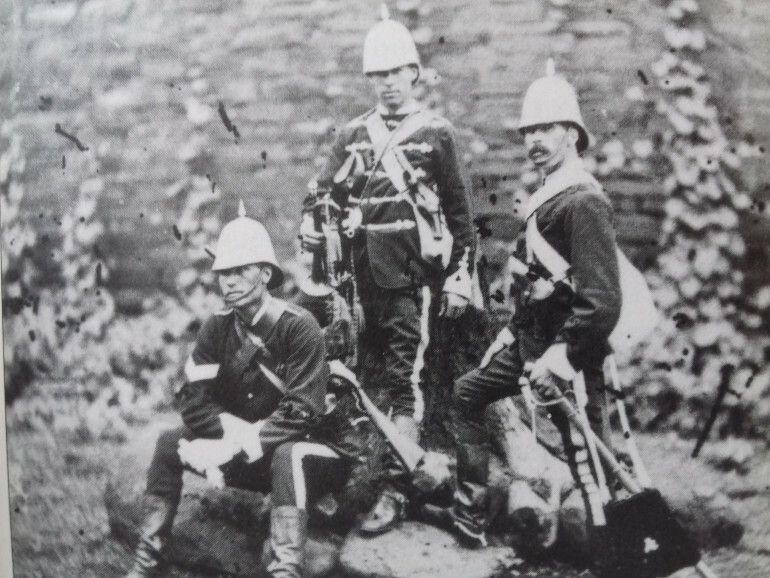 They were paid 12 shilling a day (60p) to cover their loss of income while on service. The Natal Carbineers had been operating in the African colony since 1855 making it the oldest auxiliary unit to take part in the Zulu War. 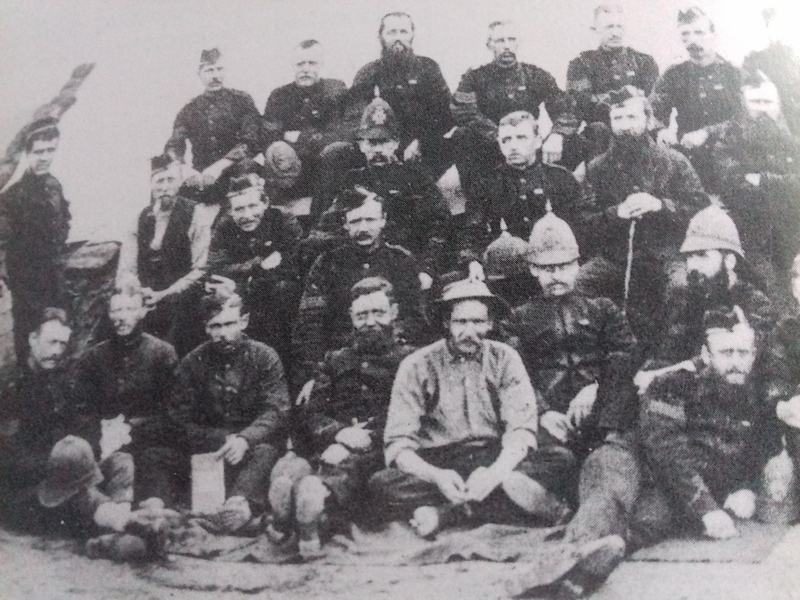 There were three officers and 57 troopers in this unit at the beginning of the war. 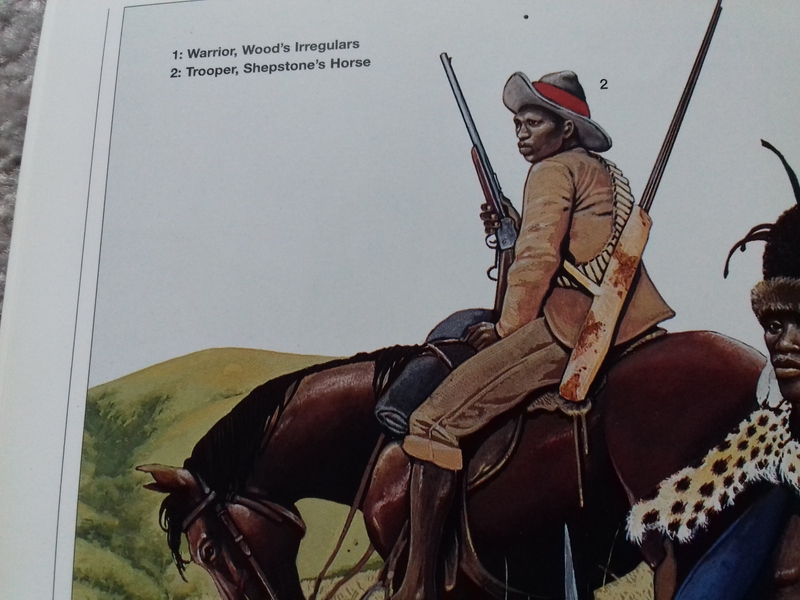 They were mainly attached to the third column of troops that invaded Zulu Land and as a mounted unit acted as scouts and mounted infantry. They wore blue jackets and a rather fancy white foreign service helmet with a spike. 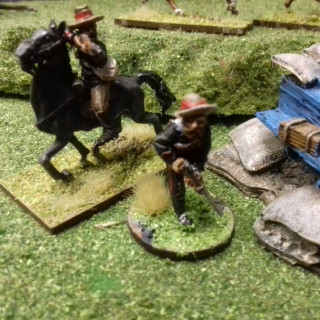 The horse and the rest of the equipment would be paid for by the trooper themselves.